In 2003, the highest number of attacks (70) and the highest casualty count (159 persons dead and 951 wounded) occurred in Asia. There were 82 anti-US attacks in 2003, which is up slightly from the 77 attacks the previous year, and represents a 62-percent decrease from the 219 attacks recorded in 2001. Most of the attacks that have occurred during Operation Iraqi Freedom and Operation Enduring Freedom do not meet the longstanding US defi nition of international terrorism because they were directed at combatants, that is, US and Coalition forces on duty. Attacks against noncombatants, that is, civilians and military personnel who at the time of the incident were unarmed and/or not on duty, are judged as terrorist attacks. How often the liberal press stresses the expression that by hitting the terrorists hard only creates more terrorists? The little published truth is that when terrorism is hit hard the number of incidences decreases. These terrorists do not deserve the dignity of spiritual resolve as the press likes to present them. The great pressure the Bush administration put on Islam in Afghanistan and Iraq has reduced international terrorism, and discouraged new terrorists from jumping on the band wagon. Taking the battle to the terrorists homeland has spared unknown numbers of innocent civilians on the international scene. The price is being paid by our military in the Middle East rather then being paid by innocent civilians in New York City. It is a far better policy to give the terrorists a rallying point in their own homeland with our military then give them relief to pick their own targets. The ranks of terrorism are decreasing dramatically, and their replacements have little hope of glory when they become simply fodder destroyed in their own backyard. Israel has practiced hitting the terrorists on their own ground, and it works despite what the press may say. The Jews have stood in the midst of an Islamic Arab culture that hates them beyond belief, and the State of Israel has expanded and prospered. The Israeli Defense Forces are second to none as an Army on the international scene. All this has been accomplished while the terrorists were doing their worst. Terrorism has failed to stop the Israelis. All they can do now is forever torture the Jews with pin pricks. The mighty Nation of Israel is too well established now for the Islamic world to ever think they can be intimidated into leaving. It is Islam that must step aside as the God of the Bible prepares the Holy Land for His coming Kingdom. A terrible judgment is coming to Islam. A most terrible judgment is coming specifically to the Islamic, Arab, Palestinians. The pricking brier is condemned in the Bible already. The blood from their vengefully hate instilled culture flows in the streets of Palestine already. The greater judgment is still coming. The Bible says God is sanctified through judgment. His holiness must judge sin, or it is meaningless. It is only when sin is judged that the contrasting holiness is exalted. At Calvary, Christ stood in the sinners place. He bore the penalty of sin on His own body. His blood was shed as an acceptable atonement for sin. It is you who refuse to come to Christ for salvation that make judgment necessary. All who reject Christ, and His holiness reserve His eternal wrath as their coming judgment. An Israeli company has developed a device that, by remote laser, scans cars and people from several meters away to detect explosives, drugs or other illegal materials. International Technologies Lasers (ITL), based in Rishon Letzion, is expected to sign a contract with the Public Security Ministry in the near future. Several branches of the United States security forces have also examined the device and are enthusiastic about its performance. CEO Ami Rub said the device will be tested in the field by the end of this year. He said the company's own tests give the device a success rate of close to 100 percent in recognizing and detecting materials. Technology has opened many doors for the worst of our cultures to do their worst on the innocent. It is good to know that technology also provides the innocent with methods of detecting the bad guys, and stopping them before they can act! It is a Jewish invention that has the potential of stopping the terrorists in their tracks. What a blow this can be by removing concealed bombs from the arsenal of the wild animals that use them. Imagine a detection system that knows and keeps tract of the thoughts of all mankind. Imagine a rod of iron that acts before a sinful act can be committed. Imagine the next dispensation when Christ will rule His coming Kingdom. Here again a 100% Jewish solution will protect the innocent for the next 1000 years. The standard will be absolute righteousness as taught in the Bible. The rules will be only as the King says they be applied. The Bible says He is the Word of God! There will be no religious courts debating the meanings of the statutes and ordinances. Christ alone will be the sole interpreter of how the Bible will be applied to the lives of every individual. He will measure their heart with 100% accuracy. He will look into the inner man, and make His determination on that basis. No manmade device will ever be able to duplicate such accuracy as will be practiced in the next dispensation. A perfect King administering perfect righteousness from a perfect Kingdom that will be located in Israel, at Jerusalem, and from the Temple Mount. It is this Christ who offers salvation by grace to you this very day. Won't you come to Him for a perfect salvation of purity and perfect holiness. It is only this Christ of the Bible who can wash away your sins by the authority of His shed blood, and make you absolutely perfect. Only then will you be prepared for His Kingdom, and for eternity with Him. 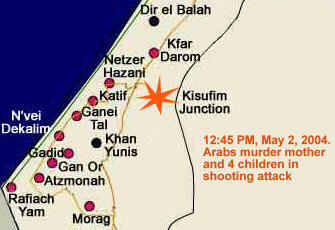 Double terror attack at 12:45 PM today, Gazan Arabs opened fire and murdered a mother and four of her children and injured a civilian and two soldiers on the Kissufim Road leading into Gush Katif, along Israel's southern Mediterranean coast. The preliminary investigation indicates that two terrorists came from the nearby Arab town Dir el-Balah and waited for an Israeli car to pass by on the main vehicular artery which leads into the Gush Katif region. The first burst of gunfire targeted a civilian vehicle, murdering a mother and her four children. As a second civilian car approached, the terrorists opened fire again, as was the case when the third vehicle arrived, an armored IDF patrol vehicle. The soldiers immediately returned fire and engaged the terrorists in a gun battle. As the soldiers pursued the attackers, an explosive device or a grenade was detonated against them, resulting in injuries. The terrorists were eliminated. Prof. Aaron Vishnitzer, deputy director of Beer Sheva's Soroka Medical Center, reported that three terror victims are being treated, with a soldier and a civilian in moderate condition undergoing surgery and a second soldier in light condition. Hamas, Yasser Arafat's Fatah and the Islamic Jihad claimed joint responsibility for the murder in cold blood of a mother and her young children. According to Voice of Israel's Avi Yissakharov, the Hamas is boasting that just as they are successfully driving the Jews from Gaza, so will they drive the Jews from other regions in Israel. In what has become a common scenario following terror attacks, Arab civilians in several locales under Arafat's control celebrated in the streets the murder of a Jewish mother and her children. The Arab civilian culture dances in the street partying all night over the murder of a Jewish mother and her 4 children. How more depraved can a people become? Yet, these are the people the gentile quartet of the US, EU, UN, and Russia would plant forever in the middle of the Holy Land. This culture would forever torture the Jews of Israel by such acts of premeditated murder. What politician can say "Road Map" without knowing the kind of culture that will surround the Jews of Israel forever should it be implemented? What Christian can deny that the "Road Map" would forever prevent the implementation of the Biblical Kingdom in Israel, at Jerusalem, and from the Temple Mount? It is for their wickedness that the God of the Bible will soon manifest His wrath. The gentile world will cry out claiming God is unfair. The gentiles think this culture has the right to the Holy Land, and if the Jews stay they must forever endure their torture. This is not God's future plan for Israel, Jerusalem, or the Temple Mount. The gentile "Road Map" is not the Biblical plan! Christians should oppose it as a last expression of their testimony for the Bible before the rapture takes place. I'm convinced the invasions of Afghanistan, and Iraq were the right thing to do. I don't think the job will be compete until Syria also falls, but stepping into the affairs of the Jews and the Holy Land is ground where we do not belong! That is God's business, and He must not be hindered. Dispensational change is coming to this generation, and the gentiles best stand aside as God prepares the Holy Land for His coming Kingdom. The wickedness of the heathen, Islamic, Arab, Palestinians is legion. Their culture has no redeeming values worth saving. Should they be wiped off the face of the earth, it would be no loss to human history. Arafat and his thugs fall into the same category as Hitler and the Nazis. A black mark that only brings disgust to those historians who read about their short reigns. They are vomited out as poison to the dignity of God's creatures. All the human race bares the same black mark. Our individual reign on earth is short. The books kept by God of our lives are records of sin. What we might think are good works fade quickly when exposed to absolute holiness. Christ is the only Savior who came, and died for such a wretched people. Rejection of such love is wickedness beyond comprehension. It will be forever placed under the wrath of the living God. It is a forever judgment with no appeals according to the Bible. My friend, your reign on earth will come to an end. Are you saved, or are you soon to enter hell for all eternity future? It is your decision to make. Chose Christ before it is too late! * and now, the latest addition: Kidmat Tziyon, otherwise known as Abu Dis. Kidmat (from the word meaning 'advance' or 'front') Tziyon is a project of Yeshivat Ateret Cohanim, a community in what is known as the Old City's "Moslem Quarter." Late last night, some 150 members of the yeshivah escorted four families as they moved into two newly-purchased homes in Abu Dis. The new tenants brought generators, furniture and other equipment to begin setting up their new community, which is planned to comprise 320-340 housing units in the future. Located only 100 meters from the building intended to serve as the PA capital in Abu Dis, the new neighborhood can be read about at www.jrpisrael.com. A Jewish group purchased the land as part of a large 150-acre plot in 1924, but their plans to build a neighborhood never materialized because of Arab pogroms and British refusal to grant permission. In the 1940's and 50's, Arabs began building in the area, though a part of the land remained mostly non-developed. "The Jewish neighborhood that was slated to be built in the 1920's, will now be built by us," says Daniel Luria, spokesman for the Jerusalem Reclamation Project. "We are simply completing the job." Ariel Sharon's plan to unilaterally expel 8000 Independent fundamental Jewish settlers from Gaza was rejected soundly in a referendum of his own Likud Party on Sunday. These tenacious settlers continue occupying and conquering the Holy Land, Jerusalem, and soon the Temple Mount irregardless of the ebb and flow of secular politics. Today, the conservative Likud Party shows support, but tomorrow they may stab the settlers in the back depending on the politics of the day. The world either admires the settlers, or hates them as spoilers of the gentile road map. The lukewarm American Evangelical community holding with their neither hot or cold disposition remains silent. There is no pressure on the secular political system to stand behind these settlers 100%. There is no pressure to force the secular government to abandon the road map. The pompous Christians of America do not want to be replaced as having failed by a Jewish dispensation. The Charismatic false prophets tell the Evangelicals on TV of great Christian revivals while the whole Church is doctrinally naked, and about to be spewed from God's mouth. A Jewish Christ is not wanted by these know it all prophets of the TV circus shows. The real miracles of today are seldom proclaimed in awesome acknowledgement that the Jews are occupying and conquering. The hand of God in this generation is clearly on the Holy Land, Jerusalem, and the Temple Mount. Only unseen miracles of emotional show time claims are put on the Christian air waves. The poor victims die of the very diseases they are told were just healed. The throngs of wheelchair victims leaving in the same wheelchairs with severed, or dried up limbs are never shown. Real miracles are too much for the phony doctrinally incorrect showmen now leading the Evangelicals by the nose. Sharon is a foolish shepherd leading the Jews into abomination. His doctrine is not Biblical, but political. His addendum would thwart the coming Kingdom if that were possible. The Pat Robertson's and Benny Hinn's of this generation are the same thing to the Evangelicals. They stand only for what will give them fame, not the fundamental doctrine of the last generation of the Christian Church. Dispensational change is the only answer to a generation of Christianity that has become so doctrinally naked. Friend, are you trusting the christ of the TV extravaganzas, or the Christ of the Bible? Many are already revealed in the Bible as following the wrong christ. They are not going to be accepted because they sought the phony rather then the true. Beware of leaving the Bible for popular emotionalism. Do not follow the foolish shepherds of Evangelicalism. Come to the only Christ of the Bible before it is too late, and you be left behind! Henry, M. (1996, c1991). Matthew Henry's commentary on the whole Bible : Complete and unabridged in one volume (Nu 35:9). Peabody: Hendrickson. Diplomats tell US leader his support for Israel is costing their country its credibility, prestige, friends. WASHINGTON - A group of 58 former US ambassadors and diplomats on Tuesday condemned US policy in the Middle East saying that President George W. Bush had cost the United States "credibility, prestige and friends". The former diplomats released a letter which they said was inspired by a similar protest made by British diplomats to British Prime Minister Tony Blair. Like the British diplomats, the former US foreign service officers said they were "deeply concerned" by Bush's endorsement last month of a proposal by Israeli Prime Minister Ariel Sharon to withdraw from the Gaza Strip and parts of the West Bank. The plan has now been put in doubt by its rejection in a vote by Sharon's Likud party. The diplomats, who included former ambassadors to many Middle East countries, said Bush's policy "defies" and "flouts" a series of UN resolutions on the Palestinian conflict and the right of Palestinian refugees to return to their land seized by Israel. "By closing the door to negotiations with Palestinians and the possibility of a Palestinian state, you have proved that the United States is not an even-handed peace partner," said the letter to Bush. "You have placed US diplomats, civilians and military doing their jobs overseas in an untenable and even dangerous position. "Your unqualified support of Sharon's extra-judicial assassinations, Israel's Berlin Wall-like barrier, its harsh military measures in occupied territories, and now your endorsement of Sharon's unilateral plan are costing our country its credibility, prestige and friends." The diplomats called on the president to "reassert American principles of justice and fairness in our relations with all the peoples of the Middle East. Support negotiations between Palestinians and Israelis, with the United States serving as a truly honest broker." They added that "a return to the time-honored American tradition of fairness will reverse the present tide of ill will in Europe and the Middle East - even in Iraq." P.A. Radio Praises "Heroic Attack" On "Settler-Terrorists"
Several hours after the murderous attack on the Hatuel family of Katif - leaving David Hatuel bereft of his entire family: his pregnant wife and four daughters - PA radio praised the murderous terrorists as "heroic martyrs," and their heinous crime as one of "heroic martyrdom." In its report the next morning, the PA radio referred to the Jewish residents of Gaza as "settlers" and "terrorists" in light of their plans to build a new neighborhood in N'vei Dekalim. The radio mentioned that the victims of the Sunday attack were "settlers," neglecting to note that they were a pregnant woman and four little girls who were shot to death at point-blank range. So reports Dr. Michael Widlanski of Hebrew University. Justice and fairness by these diplomats makes a mockery of the terms. Only the God of the Bible can be just and fair, but by His standard the whole world is guilty. These diplomats have a one sided standard that ignores the death of the Hatuel family. Justice and fairness to pregnant women and little girls does not matter to the diplomats because they are Jewish victims. Justice and fairness does not apply to the independent fundamental Jewish settlers by most of the gentile diplomatic community. It is the settlers who clearly receive no justice or fairness in the present political climate, but the gentile standard says the Jews are always at fault for everything bad that happens in the Holy Land. The Holy Bible sets a standard of righteousness that the gentile world rejects. They would say God is unjust and unfair for choosing the Jews to settle the Holy Land in this generation. They would vote God out because He gives no rights to the heathen, Islamic, Arab, Palestinians in the Holy Land. The culture that glorifies the murderers of pregnant women, and little girls has no rights according to the God of the Bible. The Koran that justifies such actions as being religiously fair is an abomination forever according to the Bible. All of Islam will soon be crying "unjust," "unfair" as Ezekiel 38 & 39 comes to pass. An entire culture, an entire religion will be put to death! God crushes all Islamic influence over the Middle East in one stroke. The Islamic religion is wiped off the face of the earth by the God of the Bible. It does not solve the Middle East conflict, nor will it be intended to do so. The gentile heart will only harden as God forces His will on the entire planet through His actions in Israel, at Jerusalem, and on the Temple Mount. There will only be one standard of justice and fairness when dispensational change comes to planet earth. A Kingdom will establish God's holiness once again on all creation. The revenger of blood will be God Himself on all of Islam first, then the whole world, for the kind of justice and fairness being practiced in the Holy Land today! The whole world is going to find the revenger of blood coming upon them for what they did with the LORD Jesus Christ. It is His blood only that all will be called to give account. Beware that a false christ not make you guilty of reprisal by the Biblical revenger of blood! With a turnout of little over 50%, grass roots pro-settlement activists in Israel’s governing Likud party roundly defeated Prime Minister Ariel Sharon’s plan to unilaterally uproot Jewish communities in Gaza on Sunday, plunging the deeply divided center-right cabinet into crisis. Refusing calls from the right and left of the political spectrum for his resignation and fresh national elections, Sharon insisted that he would both respect the referendum result and continue to lead the country according to his conscience. “The public did not elect me to sit and do nothing for four years,” Sharon said in a statement as exit polls showed that almost 60% of the 100,000 party members who voted opposed his plan to “disengage” from Gaza and much of the West Bank. According to Deputy Prime Minister and Sharon confident Ehud Olmert, Israel has no choice but to push ahead with the plan. "In a sea surrounded by almost two million Arabs, like we are in the Gaza Strip, there is no future,” he said. “There is no chance. This cannot continue. People say that when we leave there will be terror. But all this is happening when we are there, because we are there,” Olmert added, referring to Sunday’s murder of a pregnant mother and her four children near their Gaza settlement home. Disappointment at the plan’s defeat was evident in Washington where US President George W. Bush has come under fire from Arab capitals for openly backing Sharon and offering him historic diplomatic guarantees on remaining major West Bank settlements and the return of Palestinian refugees. Maintaining that its view of events had not changed, the White House praised the plan as “a courageous and important step toward peace," and pledged to consult with Sharon "about how to move forward." In Ramallah, Palestinian Authority cabinet minister Saeb Erekat called on Bush to withdraw the written pledges made to Sharon during his April 14 summit in Washington, arguing that they undermine the Palestinian people’s national rights. The PA has consistently opposed any unilateral Israeli action, including the Gaza pullout, on the same basis. On Sunday Erekat went further, denouncing the referendum in similar terms, saying that voters from Israel’s governing Likud have no right to decide on the fate of Palestinians. "The rejection of the plan by Likud voters may have critical effects on Israel's situation,” Labor MK Eitan Cabel told Israel Radio on Monday, after presenting a bill to disperse the Knesset. “The Knesset must be dissolved, and the public must be allowed to vote on this issue," he said. Within Sharon’s own fragile coalition, Shinui leader Yossef Lapid said on Monday that the plan had only been rejected by a quarter of the members of one party, and should not bind Shinui or the Knesset as a whole. "We can't forget that these were not real elections," Lapid said. "The Likud is not the general public. 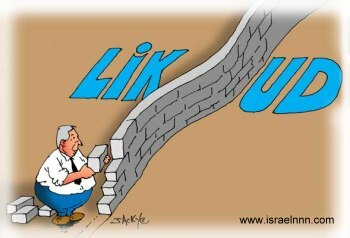 The Likud has lost touch with the public and it cannot be allowed to decide the fate of the country." Lapid and fellow Shinui MKs were meeting Monday afternoon to discuss quitting the government if Sharon abandons disengagement and leaves the Cabinet without a viable diplomatic platform. Meanwhile Tourism Minister, Benny Elon, leader of the right-wing National Religious Party, told Army Radio that he was prepared to walk out of the government and hopes Sharon is prepared to do the same. "I suggest Sharon first fire his cronies, then leave his office," Elon said. The secular politicians think they run the future of Israel. Reality says God is running not only the future of Israel, but the future of all mankind. The worms God puts in positions of authority moan and groan when their selfish visions are dashed to pieces. The worm mass wiggles in agony when circumstances go beyond their perceived control. Far better to submit unto the inevitable, which is God's plan, rather then putting hope and trust in the worms. The whole gentile world wants to give the heathen, Islamic, Arab, Palestinians a right to the Holy Land. It is the God of the Bible who says they have no rights on this issue. The Land is destine for the Jews from of old to everlasting. It is this generation that is experiencing the Biblically predicted return of the Jews to the Holy Land. Nothing is gong to stop God from finishing the work that He has started. No giving away the Land that God has already put under Jewish control. No placing a heathen nation forever in the Holy Land. No amount of pressure from the gentile world to stop the coming Kingdom of God will ever have a final victory. The God of the Bible does not have to make a worldwide assault on this world of sin. All He need do is force His will on Israel. Jerusalem, and the Temple Mount. The world will come to Him. Not in adoration, but in hate. This generation does not want the puritanical holiness that must come with the return of Christ. This world will never tolerate the future God has already dictated in the Bible as the future for the Holy Land. Armageddon is where resistance to the Bible is leading. The worm masses are wiggling in agony. They will never submit to such authority as is revealed in the Bible. The freedom to sin is a right the worms feel ought to be theirs. Freedom of religions that reject the Bible, or would put other writings of worms above the authority of the Bible are what the masses demand. The return of the LORD Jesus Christ to the Holy Land. to Jerusalem, and to the Temple Mount as King of the Jews is a prospect this generation publicly opposes. The lukewarm Evangelical main stream Christian Church has no intention of standing aside for the Biblical future of the Holy Land. They instead stand in the way by supporting the politicians rather then the God of the Bible. It is time to awake oh sluggards who left fundamental Biblical doctrine fall into disrepute during this generation. You who left Charismatic emotionalism hijack "born again" so the tares now dictate the direction of main stream Christianity. Awake! It is time to step aside in shame for dispensational change. Only the Christ of the Bible can correct what this generation has defiled. I pray you can discern the difference between the Christ of the Bible, and the multiple christs of main stream Christianity? Won't you come to the Biblical Christ of absolute holiness for your salvation! Do it today! Awake, awake, awake! Greek Olympic officials have not listed Jerusalem as Israel's capital city on the official website for the 2004 Athens Olympic Games (www.Athens2004.com). The entry opposite the heading 'capital' is marked with an asterisk figure (*) instead. A footnote, at the bottom of the webpage, reads: * Please visit the official United Nations website for further information regarding the capital of Israel. The comment provides a web link to a United Nations fact file on Israel, which also doesn't list the Jewish State as having a Capital, but instead writes: "The position of the United Nations on the question of Jerusalem is contained in General Assembly Resolution 181 (II) of 29 November 1947." Some months ago, the website had 'Jerusalem' down as the capital of 'Palestine', while Israel's capital slot was left empty. Following complaints lodged by National Union MK Arye Eldad with the Greek Embassy and Foreign Ministry, Israel's capital was entered as 'Tel Aviv', leaving the Palestinian slot blank. At this point, the Foreign Ministry approached the organizers of the Olympics, reaching a compromise by which both the Israeli and Palestinian capitals would be omitted from the register. Foreign Minister Deputy Spokesman David Saranga said that by this step, he views the matter as closed. Pressed, he said that the affair was still under inquiry, and that it was really a matter for the Israeli Olympic Committee. The committee, for its part, said the issue was strictly a diplomatic one, to be dealt with by the Foreign Ministry. Another Foreign Ministry official pointed out that it is not only the Athens Olympic site that doesn't recognize Jerusalem as Israel's capital, but rather the vast majority of the world, including the US. But, he pointed out, it was important to make clear that Tel Aviv is not the nation's capital. The official said that the Foreign Ministry doesn't intend to pursue the case any further, and that there are more important issues to press with the organizers of Olympics. One such issue, he said, is a request that there be some kind of commemoration during the games of the 11 Israelis killed at the 1972 Munich Olympics. One idea was for a moment of silence during the Games' opening ceremony, an idea that has so far been refused by the organizers of the Games. The Greek Ambassador was unavailable for comment. There is not much difference between the Palestinian acceptance of Israel, and that of the International community. At Oslo Arafat signed a statement in the presents of Bill Clinton saying the Palestinian charter would be changed to recognize the existence of the State of Israel. As of today, that charter has not been changed! It reads exactly as it always did ignoring the Jews, and claiming all of the Holy Land for the Palestinians. The maps of the Middle East given to the Palestinian school children does not include the State of Israel. They just ignore reality! It is not just the Arabs who hate the Jews so much that they can't even put them on the map, but now let it be clear the gentile international community treats the Jews with the same contempt irregardless of what reality says is true. The God of the Bible has brought the Jews back to their Promised Land during this generation. In 1967 the Jews conquered all of Jerusalem including the Temple Mount. The God of the Bible is forcing His will on the whole planet by one lone piece of land.. Reality causes the entire world to acknowledge this most wondrous of miracles, and the world just ignores reality. The world also does its best to ignore the reality of the LORD Jesus Christ. I suppose the thinking is that when judgment day comes they will just claim ignorance, and call God unfair should He hold them responsible for resisting the free salvation He offered to any who would submit and come. It is just not going to work. Hiding from reality, and claiming ignorance when it is so clearly presumptuous can never work with the God who can see the inner man. Such deceitful sin will be judged harshly according to the Bible. The great sin of this generation is to be willingly ignorant of what God is doing in the Holy Land, at Jerusalem, and on the Temple Mount. Ignoring Jerusalem at the Athens 2004 Olympics can only bring condemnation from the God of the Bible. Ignoring the salvation offered by the Christ of the Bible brings the same condemnation. There is no such thing as ignorance. There is either hateful resistance to reality bringing condemnation, or willing submission with all the heart, all the soul, and all the might. Hell is for the unredeemed. It matters not the degree of presumption to ignorance. It is all sin of the darkest hue, and God's holiness demands He judge one time for all eternity those He knows are guilty! Break from the crowd going to hell clinging to willing ignorance as their hope. Come to the Christ of the Bible who will lead you to knowledge of purity, righteousness, and holiness. Only this Christ can receive you to glory! This Saturday night starts Lag Ba'Omer, the 33rd day of the counting of the Omer. The day has been set aside by our sages as a day of commemoration of Bar Kochba's military revolt against the Romans, as well as the anniversary of the death of Rabbi Shimon Bar-Yochai (both of the 1st-2nd centuries CE), Kabbalist and dissident in Roman-occupied Israel. According to some traditions, Lag Ba'Omer also represents the end of a period of mourning for thousands of students of Rabbi Akiva, who died in a plague at this time of year. Israelis mark the day with community bonfires throughout the country, accompanied by food, play and song. As reported earlier this year, the government has decided to make Lag Ba'Omer a national day in honor of IDF reserve soldiers, as well. As every year, the tomb of Rabbi Shimon Bar-Yochai in Meiron, in the north of the country, is expected to receive more than 100,000 visitors over the course of the coming days. However, all is not in the best shape at the site, according to Haim Ben-Simol, who is responsible for tomb. Speaking with Arutz-7 on Thursday, he said that there is reason for grave concern over security arrangements for Lag Ba'Omer. While there are security guards at the location, he explained, they lack basic equipment such as metal detectors and the ability to control the flow of the anticipated crowds. In addition, Ben-Simol told Arutz-7 on Thursday that the electricity to the site has been cut off due to the staggering NIS 70 million debt of the Holy Sites Authority. The money due to Israel Electric was to have been allocated to local authorities by the Ministry of Religious Affairs, but that entity was dissolved. At present, a generator supplies limited electricity during the day and a temporary arrangement has been made with Israel Electric permitting activation of the local grid during the nighttime hours. Meanwhile, Magen David Adom emergency medical service officials announced this week that they are setting up a special command center near the Meiron tomb, which will operate out of three buildings. Staff will include physicians, paramedics and EMTs, as well as mobile first aid stations and other required personnel and adjuncts. Volunteers of the Jerusalem branch of the Hatzolah first-response organization have also established a command post in Meiron. Tradition, tradition, tradition is fine until it comes into conflict with the written Word! It is then that tradition must be abandoned. The Jews have the longest Biblical history of tradition above all other peoples. Those traditions that square with the Bible are good, but many of those traditions square only with pharisaical men who put legalism above the Bible. This is the problem with the Mishna and Talmud. These commentaries on the Bible by various Jewish Pharisaical sages after the fall of the last Jewish Temple gave Judaism the religious traditions of today. They were written for a people without their Promised Land, and without their Holy Temple. The Mishna and Talmud was quickly exhaled over the Bible because without the Land and the Temple, Biblical Judaism could no longer be practiced. Shame was the only message coming from the Bible, and so a pride filled system imbedded within the Mishna and Talmud replaced the shame filled lesson with traditions of dignity. Today, the Mishna and Talmud no longer are an excuse for Jews not to return to the Bible and Biblical Judaism! The God of the Bible has brought the Jews back in this our generation to the Promised Land. In 1967 after the 7 Day War, all of Jerusalem including the Temple Mount was suddenly back in Jewish hands. 2000 years of tradition just as suddenly became nullified. 37 years have now passed, and yet there is no independent fundamental Jewish call to abandon tradition for the literal Bible. I suspect this call will not occur until after the rapture of the "born again" Christian Church. The rapture will separate the wheat from the tares. The great Apostate Whore of today's Christianity will be left behind to defy the God of the Bible, and His chosen People. I'm convinced two Jewish men from Jerusalem wearing sackcloth and ashes will be the first of the true Biblical Jews who will lay the foundation for the next dispensation. I would imagine the first Biblical task before them will be to build Ezekiel's Temple on the Temple Mount in preparation for the return of the Messiah! The Bible says 144,000 virgin Jewish men (12,000 living mostly in Yesha on the lands of the 12 tribes) will hearken to the call. This single act on this single few acres of land will turn the entire world against the God of the Bible. There will be no middle ground. There will be no apathy regarding man's responsibility to God! The Messiah will force His will on the entire planet by just claiming this one little place as His own. Mankind will invade with hate filled indignation when Biblical Judaism reappears on planet earth! Are you ready? Are you ready to be raptured in shame for what you didn't do to maintain the accuracy and holiness of the Bible? Are your religious traditions too strong for you to admit the shameful state Christianity has deteriorated into during this generation that seeks magic not miracles? Will you remain behind upholding a system thinking it is rich and in need of nothing that has rotted from the inside out? Only the Biblical Christ can save! Only the Biblical Christ can destroy the heart of stone, and replace it with a heart of flesh. Dispensational change means the Christian Church must step aside for the coming Jewish Biblical Kingdom. Do your traditions cause you to cast away the Word of God, and in so doing cast away the need for the Jewish Biblical Law coming for the next dispensation? Beware your not trusting in the many false christs who will continue functioning in the Great Whore that will be left behind! Leave religious tradition, and go to the literal Bible! Only there can you find the Biblical Christ who has the power to save! Palestinian Authority Prime Minister Ahmed Qureia on Saturday said there was still plenty of time to reach a comprehensive peace agreement. "I hope that this is not final," Qureia said, adding that the remarks were "a contradiction to what President Bush declared." "I think that we have plenty of time from this moment until the end of 2005...to seriously negotiate...to work towards a comprehensive and permanent agreement," he told reporters in his office in Abu Dis. "If we are delayed, that means that we are giving in to the desire of the Israeli government to stretch out the negotiations and drag them out, for another 10 or 15 years as I have heard many times in the Israeli press. By then, no one will have the ability to take control of the situation," Qureia said. Bush in an interview published Friday night backed off of the road map peace plan, saying that keeping the promise of a Palestinian state by 2005 "may be hard." "Nevertheless, I do think we ought to push hard as fast as possible to get a state in place," Bush said. Having proposed 2005 as the date two years ago, Bush told the Egyptian editors of the newspaper Al-Ahram: "I readily concede the date has slipped some." He cited violence as a reason, saying "we hit a bump in the road." "I think the timetable of 2005 isn't as realistic as it was two years ago," Bush said, according to a White House transcript of the interview. Palestinian Authority Chairman Yasser Arafat responded Saturday by saying that the 2005 timetable was "realistic and more." Speaking to reporters in the West Bank city of Ramallah, Arafat said: "according to the signed agreements...our state should have been declared by 1998 or 1999." Palestinian Cabinet Minister Saeb Erekat in response to the U.S. president's remarks, blamed Bush on Saturday for undermining the road map. Erekat said Bush's remarks make the road map peace plan irrelevant by casting doubt on the timetable for its implementation. Bush acknowledged that "times are tough for the United States and the Middle East," and also apologized for the conduct of U.S. soldiers in Iraq, saying the word "sorry" six times. David Satterfield, a senior State Department official said on Friday that a renewed American effort to establish ties with the Palestinian leadership would not include any communication channels with Arafat, Israel Radio reported early Saturday. Satterfield was speaking at a conference at the Washington Institute for Near East Policy, a private research group. Satterfield raised the possibility on Friday that Rice would try to induce the prime minister to devise "a Palestinian plan parallel to what the Israelis are going to do." "You have an opportunity here to say how you are going to impose law and order," Satterfield added. Earlier on Friday, a White House official confirmed that National Security Adviser Condoleezza Rice would meet with Qureia in Germany on May 17. Rice will be the highest ranking U.S. official to hold a meeting with the Palestinian prime minister. The gentile road map is in serious trouble because it is a plan that goes contrary to the Bible. The great Christian nation of the United States with a President who claims he is "born again" are all defying what the Bible says God is doing in the Holy Land. I can't imagine a greater road block to God's plan then to place a heathen, Islamic, Arab, Palestinian State forever in the Promised Land of the Jews. It is either blatant ignorance, or a phony Christianity that produces such blindness? The US should be cleaning out the terrorist regime of Syria rather then treading into God's affairs with His chosen people. Lebanon is where the Christian soldiers should be fighting on God's side as they are presently fighting in Iraq. Instead of helping God, the Christians are proposing plans that would prevent the return of the LORD Jesus Christ, and His coming Kingdom to the Holy Land, Jerusalem, and the Temple Mount! It is a plan doomed to failure that will ultimately lead only to Armageddon! The God of the Bible made promises to the Jews about the Holy Land. He made no such promises to Ishmael. He made no such promises anywhere in the Bible to the Christians. It is only the Jews who have a Biblical connection to the Land! The promises to the Jews are all connected to the Land, and there are no promises that can be applied to the Jews without the Land! The centerpiece to the Land was always the Temple! Jerusalem has always been the most important city in the Bible because it was the only authorized site for the Temple. This was the only place where man could meet with the God of all creation. It was the only place where worship of the God of the Bible was accepted. It is this system that God is bringing back to planet earth. It is the fulfilling of the promise made to the seed of Abraham, Isaac, and Jacob! This time the Messiah/King will rule with a rod of iron. This time the Kingdom will be victorious over all opposition. No Yasser Arafat, no Palestinian State, not even the mighty US can stop God from fulfilling the promise He made in the Bible to the Jews about the Land! Are you part of that promise? Do you trust in the Biblical Messiah/King? Are your sins washed away by the promise of the Biblical Christ? Has His blood been applied to the inner man of your heart? Can you say without hesitation that you love this Jewish Savior with all your heart, all your soul, and all your might? You can go to the Biblical Christ right now! Won't you go to Him? Israeli Prime Minister Ariel Sharon is to submit an alternative to his plan of unilateral disengagement from Palestinian areas within three weeks. Mr Sharon made the announcement at a cabinet meeting following his Likud party's rejection of the plan to pull out of Gaza and parts of the West Bank. He has cancelled a planned visit to the US to start consultations on the plan. Meanwhile, Arab League chief Amr Moussa has said that the postponed Arab summit will be held in Tunis on 22-23 May. The annual summit - where Mr Sharon's pullout plan and also Iraq are set to be the key issues - was postponed due to differences between some Arab nations over political reforms. On Sunday, violence continued in the Gaza Strip, where at least one Palestinian was killed in an exchange of fire with Israeli soldiers. The Palestinian leadership has renewed its calls for a return to the international peace plan known as the roadmap. Palestinians reject Mr Sharon's unilateral disengagement plan, saying it is being imposed on them. Later this month Palestinian Prime Minister Ahmed Qurei is expected to meet US National Security Adviser Condoleezza Rice - his highest-level meeting with US officials since taking office late last year. Mr Qurei is likely to insist Washington helps to kick-start the roadmap, which envisages a Palestinian state being set up by the end of next year. Mr Bush told an Egyptian newspaper is would now be "hard" to achieve a Palestinian state by 2005, as the roadmap proposed when it was first unveiled. The heart hardens as God forces His will upon the Pharaohs of this generation. Ariel Sharon will not take NO from the God of the Bible. He continues to stay the course with a rejected vision that continues to cause worse and worse plagues on the people. The red flags should go up on any plan the heathen, Islamic, Arab, Palestinians would suddenly approve. These hate filled Arabs opposed Sharon's plan until the tide changed in Israel. Always standing against anything Jewish these interlopers have suddenly changed their spots on the issue of unilateral withdrawal of the Gaza by the Jews. First they opposed it because Sharon did not negotiate with them before hand. Now, they oppose it because the conservative Jewish people revealed they were not on board with Sharon when it comes to giving away God's inheritance! Only the Palestinians could get away with such a 180 silent reaction by the gentile press. Hardened hearts are the only sure result of God's plan for the future of the Holy Land. The secular Israelis, the Palestinians, the entire gentile world can be expected to resist the God of the Bible. The ultimate goal of God is to bring Biblical righteousness back to planet earth through the coming Kingdom He is establishing in the Holy Land, at Jerusalem, and from the Temple Mount. The gentile road map has as an ultimate goal to place a heathen State in the middle of the Holy Land so God's Kingdom can never be planted. I doubt the gentiles would give God the moon as an alternative plan were such a change possible. It will be the Holy Land, and no other place. Mankind must submit, or hearts will harden! The end is clear in the Bible. The times of the gentiles will end! Armageddon will have to be the precursor to the establishment of the coming Kingdom! Hearts do not harden quicker then when pressed with the truth about the LORD Jesus Christ. Whenever the individual is forced into confrontation with what the Bible says about the sinner's responsibility to the blood sacrifice at Calvary, - hate, anger, and hardness of heart sets in. All who will be destroyed at Armageddon will be those who will refuse in mass the salvation offered by Christ. It will be because Biblical righteousness is not an option when coming to the Biblical Christ. Mankind is predicted to die for the right to sin rather then submit to a puritanical Kingdom that will come to the Holy Land, at Jerusalem, and from the Temple Mount! Where are you? Do you resist the Biblical Christ? There is only one Bible. There is only one Biblical Christ. There will be only one government that will dictate only one religion when the Kingdom comes. It will not be a gentile government, but a reign by the perfect Jewish King who is coming again! VLADIKAVKAZ, Russia May 10, 2004 — Chechen President Akhmad Kadyrov was buried Monday in his home village, a day after the Moscow-backed leader was killed by a bomb blast that cast Russia's efforts to stabilize and control the war-ravaged region into chaos. Thousands of people came to Tsentoroi, the settlement in southeastern Chechnya that is home to Kadyrov's clan, Russian media reported. Mourning ceremonies were to go on for three days. The blast ripped through a stadium grandstand in the Chechen capital Grozny Sunday during a Victory Day parade celebrating the anniversary of the Nazi defeat in World War II. The Grozny emergency medical center said 24 people in all were killed and 46 wounded. But Chechnya's Deputy Minister of Emergency Situations, Akhmed Dzheirkhanov, said Sunday that the death toll was six and that 57 people were wounded. Dzheirkhanov said rescuers from the center had counted some of the wounded as dead. He did not confirm Russian media reports of a seventh death overnight. Among the dead were Khusein Isayev, the head of Chechnya's State Council, and Reuters photographer Adlan Khasanov. The wounded included the top Russian military commander in Chechnya, Col.-Gen. Valery Baranov, who officials said was in critical condition and had a leg amputated. The bombing which thwarted the heavy security in place for official ceremonies nationwide on an important holiday harshly underlined the difficulties Russia faces in controlling the violence in Chechnya despite a massive troop presence. It was expected to set off a new round of killing between Kadyrov's camp and his enemies, who had long pledged to eliminate him. Chechnya is important to the prophecy found in Ezekiel 38 & 39. The events of today tied to Islamic terrorism should cause Bible students to take note. Ezekiel clearly identifies the Gog, or more specifically the "chief prince" of the Gog, as leading the three pronged Islamic invasion of Israel in the latter years. Chechnya is the jump off place for this great invasion. The western prong of this invasion is totally Islamic, and is identified as Old Persia which is none other then Iran. The southern prong is also totally Islamic as the world is oriented presently. It is North Africa with Libya identified specifically as one of the leaders. The "chief prince" of the North remains unidentified, and only speculation can be applied to who these invaders will be? Geography plays a large roll in understanding Ezekiel 38 & 39. The invaders from the North are all identified with names that only occur in the Bible related to the journeys of the grandsons, and great grandsons of Noah who went North. It is no small thing to notice Mount Ararat sits right in the middle of the Caucasus Mountains that separate the northern invaders from Turkey (another all Moslem country). It is no small thing that Noah's ark keeps reappearing in today's news reports. The scenario from the Bible is the northern invaders are funneled by the Black and Caspian Seas into crossing over the Caucasus in route to Israel. The Moslems of Turkey join the invaders as well as many of the Moslems living around the Black Sea (Gomer). This mighty army meets up with the western and southern prongs on the mountains of Israel. The Jews are left with their backs to the Mediterranean Sea. The extermination of the Jews of Israel becomes a forgone conclusion until God steps in. Apparently a phony gentile peace plan causes the Jews to be resting in supposed safety, and no defense is mustered. Who is the "chief prince" of the Gog that leads the Islamic world into this latter year invasion? The word "chief" is transliterated "rosh," and is the word for Russia in modern Hebrew. This prince of the rosh must be a powerful arm of the Russian nation which almost all commentators identify as the Gog (a grandson of Noah). The "chief prince" is more clearly identified as the chief prince of Meshech and Tubal. Again, most commentators identify these grandsons of Noah with the twin capital cities of Russia (Moscow the greater, and Tubalsk the lesser). It is like identifying the USA by using New York, and Los Angeles as the key cities that represent the entire nation. I speculate this "chief prince" will be the Islamic arm of the old USSR. I suspect the Chechen, Islamic, terrorists will come to some agreement with the Russian government. An Islamic sneak attack invasion of Israel will be condoned, and supported by the nation identified in the Bible as the Gog! The invaders die on the mountains and in the fields of Israel. Israel and the heathen of these latter years will all know it was the God of the Bible who made this great sacrificial meal for the fowls of the air, and the beasts of the field. There will be no opposition to a Jewish Temple being built on the Temple Mount once Islamic influence is wiped from the Holy Land forever. I suspect all this will happen in conjunction with the rapture of the Christian Church. The gentile dominated Church dispensation ends, and the Jewish Kingdom age begins. The 7 years of tribulation secures the coming Kingdom that ends with Armageddon, and finishes the times of the gentiles. Are you trusting in the Jewish Christ of the Bible, or some phony gentile religious christ that will be left behind unscathed after the rapture? Examine yourself my friend. The time is short! The "chief prince" is in the news more frequently these days. The invasion route going right past Mount Ararat is being stirred with anticipation by the God of the Bible. Six Israeli soldiers are dead after their armed personnel carrier drove over a 100-kilogram explosive planted under the road in Gaza. Hamas terrorists gleefully displayed and played with the body parts in front of cameras. The Israeli forces remained in the area for longer than planned in a tireless effort to rescue the bodies. The destroyed vehicle, which had a capacity of 12 soldiers but was carrying only six, was carrying large amounts of explosives. The families of the six have been notified, though their names have not yet been released for publication. The identification process took a long while, as the bodies were in very bad condition, and not all the body parts were found. Questions have already been raised, such as whether the IDF should continue such ground-forces operations or should rather replace them with air operations that could endanger the civilian Arab population on the ground. Similar operations to find and destroy weapons-producing factories have proved very successful. This is not the first time, however, that heavy explosives have hit IDF vehicles, causing heavy casualties. Similar attacks claimed three soldiers in Feb. 2002, three more the next month, one in September of that year, and four tank crew members were felled in February 2003. The attack occurred towards the conclusion of a heavy battle waged in spurts this morning in the Zaitun neighborhood of Gaza City. IDF forces entered the city on a mission to locate and blow up explosives labs, and in fact destroyed at least two of them; several others of the 20 suspected labs have also been located. The forces include combat helicopters, jeeps, bulldozers, and tanks, and additional forces have been brought him. Hamas has claimed responsibility for the attack. IDF soldiers encircled the homes of terrorists during today's battle, and killed at least three - two from Hamas, and a Fatah leader. BAGHDAD, Iraq (AP) - A video posted Tuesday on an al-Qaida-linked Web site showed the beheading of an American civilian in Iraq and said the execution was carried out to avenge abuses of Iraqi prisoners at Abu Ghraib prison. In a grisly gesture, the executioners held up the man's head for the camera. The American identified himself on the video as Nick Berg, a 26-year-old Philadelphia native. His body was found near a highway overpass in Baghdad on Saturday, the same day he was beheaded, a U.S. official said. The video bore the title "Abu Musab al-Zarqawi shown slaughtering an American." It was unclear whether al-Zarqawi - an associate of Osama bin Laden believed behind the wave of suicide bombings in Iraq - was shown in the video or simply ordered the execution. Al-Zarqawi also is sought in the assassination of a U.S. diplomat in Jordan in 2002. The Bush administration said those who beheaded Berg would be hunted down and brought to justice. Know for certain that when the God of the Bible judges Islam it will be for their wickedness! Islam takes great satisfaction in the animals they have released on the world. They are a generation taught nothing but hate. Their consciences were seared from babyhood to accept the most vicious behavior normally attributed only to the wild beasts of the fields. Islam has encouraged this generation to become animals for Allah. A terrible example for the whole gentile world is coming to Islam. The world will turn in horror as the wrath of God is manifested on these heathens. They will become fodder for the beasts they emulate. The symbolism dictated by the God of the Bible will be unmistakable. Ezekiel 39 will be God's answer to this generation of Islam. God calls it "My sacrifice" made for the fowls of the mountains and the wild beasts of the fields. It all takes place on the mountains and in the fields of Israel. Islam comes for a spoil and a prey. They come to do to the Jewish population what their animals have done these past days to Nick Berg, and the murdered Israeli soldiers. It will be a righteous act fit for the wickedness of this generation of Islam. My friend, if you are rejecting the free salvation being offered by the Biblical Christ, and thinking it a little thing? Wake up! The wrath of the God of the Bible is awesome. What He is about to do to Islam is a little thing when compared to what He is going to do for all eternity to those who have rejected His Son! The one time sacrifice for sin at Calvary is the biggest thing that ever happened on planet earth. The resurrected Christ is coming again. The news from Israel says it is soon. He is coming to the Holy Land, at Jerusalem, and on the Temple Mount. It is submission, or face the wrath of God. It is accept Christ as your personal savior, or abide forever under the wrath of the God of the Bible. What do you chose this day? The ZOA is urging Condoleeza Rice not to meet with the head of the Palestinian Authority until he publicly refutes praise for a terrorist murderer. Journalist David Bedein says that the American media do not report on PA praise of terrorism. The Zionist Organization of America (ZOA) is urging National Security Advisor Condoleeza Rice to suspend her planned meeting with the head of the Palestinian Authority until he publicly refutes an article in the official PA newspaper praising a terrorist who murdered an Israel father and his two young daughters. "Those who incite murder by praising murderers do not deserve the honor of meeting with senior U.S. government officials," said ZOA National President Morton A. Klein. "At this crucial moment in the international war against terrorism, the Bush administration must have a policy of zero tolerance for those who incite terrorism and praise terrorists." As reported by Palestinian Media Watch, a May 6th article in the official PA daily Al-Hayat Al-Jadida heaped praise on Samir Kuntar, who is serving multiple sentences of life imprisonment in Israel for murdering an Israeli father, Danny Haran, and his two young daughters in Nahariya in 1979. The PA newspaper praised Kuntar as "a name of pride in the history of the prisoners of the national movement" and "a beacon of light for us and for the generations to come and an authentic role model. Every day that passes Samir's pride grows, and our pride in him grows greater and greater." In this connection, journalist David Bedein ("www.israelbehindthenews.com") reports that official PA radio, known as Voice of Palestine, regularly praises Arab terror attacks. Calling the station the "most influential media tool in the hands of the Palestinian government," Bedein writes that it is "the official voice of the Palestinian people... You hear [it] everywhere in the Arab street. It sets the public tone... [Its] radio airwaves were provided for the PA from Israel's Ministry of Communications with the idea that the Palestinians would be able to broadcast messages of 'peace' on their own radio and in their own language" - and yet "during the past ten years, The Voice Of Palestine has consistently praised Arab terror attacks." Last week's slaughter of a pregnant woman and her four little daughters, for instance, was described on Voice of Palestine as "an act of heroic martyrdom." As reported by Arabic media expert Dr. Michael Widlanski, the station repeatedly used the terms for "heroic martyrdom" to describe the terrorist act, and called the murders "heroic martyrs." "So there you have it," Bedein concludes. "The official media outlet of the Palestinian Authority, an entity with diplomatic relations with 138 nations around the world, endorses the cold-blooded murder of parents and their children. That is the same Palestinian Authority which receives direct aid from all of the western democracies, including the USA to the tune of more than 10 billion dollars in its ten years of existence. The United States taxpayer used to fund Palestinian Television also - until word got out about children's shows teaching small children to become martyrs." In addition to praising murderers in the official PA media, the PA has repeatedly glorified suicide bombers by naming streets, parks, schools, summer camps, and even soccer tournaments after them. ZOA leaders will soon propose the introduction of legislation to prohibit American financial assistance in any PA city that has a public site named after a convicted terrorist or a member of any organization on the U.S. government list of terrorist groups. Bedein laments the fact that "Not one U.S. news outlet reported that the PA praised, justified and glorified this week's cold-blooded murder of a pregnant woman and her four children... There are times when only the news that fits a future peace process will get printed, even as the blood flows." In a world that is prepared for the antichrist, such reporting of the news should be expected. Don't look to the news media for the truth. The return of the LORD Jesus Christ would be a forbidden story by such bias news reporters as we have today. Expect nothing but criticism for the Bible, and all praise for resistance to a Biblical future. This generation does not want the return of Christ. What they want is the antichrist! This generation does not seek Biblical righteousness. It seeks freedom of religion to worship all that is antichrist in the world today! The very worst culture of animalistic behavior is the one this gentile dominated generation would give a State forever in the Holy Land. It is the Jews who must move out of the animals way making sure the Biblical Kingdom will never come to the Holy Land, Jerusalem, or the Temple Mount! This generations of Christians are silent in this election year that will seal such a proposal. Neither Democrat or Republican Christian will stand up, and say "Stay out of what God is doing with the Jews in the Holy Land." Gentile Christian soldiers belong in Afghanistan and Iraq. Gentile Christian soldiers should be in Syria and Lebanon. But, gentile Christian solders should not tread, or impose their will on what God is doing with the Jews of Israel! This lukewarm Evangelical Church refuses to step aside for the coming dispensation. It stands aloof claiming a phony Charismatic revival of the latter rain as taking place while all the time it stands naked before God because it let fundamental Christian doctrine be stripped from its testimony for the sake of popularity - for the sake of numbers. Like King David of old, the plague is coming to reveal where the real power of God resides. It is in the faithful, not the masses. The latter day plague will only stop at the Temple Mount! It will not be until the Biblical Christ lifts His hand to stop the coming Great Tribulation by implementing the horrors of Armageddon. Numbers will be meaningless on that day when the times of the gentiles end! The stone cut without hands will crush the great gentile idol with no regard to how many will perish. Only a remnant will survive dominated by Jews who turn to the returning Christ as their Messiah. Don't expect the secular news media to ever get it straight with what is happening in the Holy Land. They gnash their teeth whenever faced with the reality that Bible prophecy is being fulfilled this very day. It is not on the Charismatic TV circus shows, but in the Holy Land, at Jerusalem, and on the Temple Mount! A small remnant are defying all the power this world can muster, and occupying the Promised Land! My friend, it is only a remnant that will be raptured out of the Great Whore of today's Apostate Christianity. The false christs of the whore will continue on into the Great Tribulation. Only those few who are trusting in the Biblical Christ will be raptured in shame for what we let happen to fundamental doctrine on our watch. Only a remnant will say on the day of the rapture "I have sinned, and I have done wickedly." The apostate masses will continue to be a thorn to the Jews, and fodder for the antichrist! Won't you come to the Biblical Christ before it is too late? Do it right now! Come with all your heart, all your soul, and all your might. Only by His blood can Biblical salvation be applied. Won't you receive Him today? (IsraelNN.com) The Temple Mount Faithful organization will be arranging a Jerusalem Day (Iyar 28 - May 19) march from Jerusalem’s Ammunition Hill to the Jaffa Gate of the Old City. The theme of the event is a march “to save the Temple Mount” as well as opposing the planned “transfer of Jews” and the “establishment of a Palestinian state”. The event will begin at 10:00 in the area of the parking lot. For information, one may contact 02-625-1112-3 or 054-482-6175. GAZA CITY (CNN) -- At least 23 Palestinians have been killed in the latest round of violence between Israelis and Palestinians, Palestinian hospital sources said. Seven Palestinians were killed when an Israeli helicopter fired a missile into the Rafah refugee camp Wednesday night, Palestinian medical sources told CNN. Five Israeli soldiers were killed in a convoy attack near Rafah earlier Wednesday, the Israeli military said. The latest round of violence began Tuesday when Israel launched an operation in the Zeitoun neighborhood of Gaza City in what it said was an effort to destroy workshops used to build Qassam rockets. The rockets are often used to attack Israeli targets, including Jewish settlements. Eight Palestinians were killed in the operation Tuesday and another eight died Wednesday, according to the Israeli military and Palestinian hospital sources. Six Israel soldiers were killed in the Gaza City operation Tuesday. Israeli helicopters circled the Zeitoun Wednesday, with two reports of separate missile strikes hours apart. Israel said that on each occasion it was firing at groups of Palestinian militants. After one attack smoke billowed out of a building and ambulances could be heard racing through the city streets a short time later. Israeli forces were reportedly withdrawing from Gaza City late Wednesday after recovering body parts of the six soldiers killed Tuesday. Palestinian sources said militant groups had struck a bodies-for-withdrawal deal with the Israel Defense Forces. The IDF confirmed it has recovered and identified remains of all six soldiers and said it had enough of the remains to prepare them for burial. But the IDF did not refer to any deal with the militants. Hamas, Al Aqsa Martyrs Brigades and Palestinian Islamic Jihad -- all labeled terrorist organizations by the U.S. State Department -- had said they were holding remains of the soldiers to use as bargaining chips in negotiations with Israel. The recovery of all body parts is required for a traditional Jewish burial. Al Aqsa Martyrs Brigades is a military offshoot of Palestinian leader Yasser Arafat's Fatah movement. The brigades, Palestinian Islamic Jihad and Hamas' military wing have carried out deadly attacks on Israeli civilians and military targets. The Temple Mount Faithful are nothing more then a Pharisaical group of Jews motivated by pride and legalism, but what they are promoting is right! The Temple Mount is center to everything God is doing in the Holy Land during this generation. The conflict will only grow more intense. Hate against what God is doing in the Holy Land will turn more and more depraved sinners from all cultures into animals. I only wonder how enthusiastic these Temple Mount Faithful will be when it is revealed that the coming Jewish Messiah who will sit on His throne in the coming Temple will be the returning LORD Jesus Christ? Great changes must happen in Jewish hearts before right motivation for building the last Jewish Temple are operating. What these son's of the Pharisees prove is the gentile world's, and the secular Jewish world's resistance to such a proposal. It is the same with the Jewish settlers. They are yet to be saved, but they are doing the right thing. They just have the wrong motivation like the Pharisees of old which is worthless before a Holy God who sees the inner man. All men come short of the holiness of the God of the Bible. It is why we need a Savior! It is why Christ is going to soon return to the Temple Mount. God will not need go from country to country in confronting the whole world with His holiness. What His Biblical plan is: will be to claim one small piece of land for absolute purity. It will be in the Holy Land, at Jerusalem, and on the Temple Mount. The whole world is predicted to resist, and come to Him. The gentiles will send their armies. It is a world of hate that will come to God at the Temple Mount. It is Armageddon! Islam is not going to stop God from bringing in the next dispensation of the Kingdom age. Ezekiel 38 & 39 indicates a disastrous invasion of the Holy Land by the Islamic Armies. I suspect the last Jihad will be at the beginning of the Great Tribulation. The last invasion of the Holy Land at the end of the Great Tribulation will be when all the gentile armies follow the Islamic example. It will be the world coming to the God of the Bible in resistant hate for His uncompromising holiness. The hearts of men must be changed. It will not be God who lowers His standards of righteousness. It must be the hearts of stone that must be broken. God has said in the Bible that this is just what He will do to the Jews of this generation. The ones brought out of captivity. The ones freed from the shackles of the dominating gentile powers. Everything God is doing revolves around being freed from the powers of sin. It takes sacrifice! It takes the greatest sacrifice that could ever be offered. God offered Himself through the sacrifice of His only begotten triune Son to take the sinners place in judgment. Blood beyond comprehension was scattered as in the slaughter by wicked, evil men so the sinner can be freed from the power of sin. Hate tried to make the blood of Christ common, but it could not be done! There can be no greater sin then for this wicked generation to turn on this Christ who provided the way by which all sinners can be saved. Friend, don't follow the false christs of this generation in their religious of hypocrisy. Seek only the Biblical Christ who remains independent of all religion. Who personally shed His blood so your personal sin can be atoned. Only He can work a miraculous change in your heart! Won't you come to Him right now? You will never be the same after coming to the real Christ. ABU GHRAIB, Iraq (AP) - Hoping to contain a spreading scandal, Defense Secretary Donald H. Rumsfeld went to the Abu Ghraib prison camp on Thursday and insisted the Pentagon did not try to cover up abuses there. A top general with him said he had given clear guidelines months ago on the humane way to question Iraqi prisoners. Rumsfeld arrived at Abu Ghraib by helicopter in a dust storm on a trip that provided respite from a storm of a different sort back in Washington. There, the No. 2 general and civilian at the Pentagon both indicated Thursday that interrogation techniques used in Iraq had violated the Geneva Conventions and said they did not know who, if anyone, had approved the use of those techniques. The two, Marine Gen. Peter Pace and Deputy Defense Secretary Paul Wolfowitz, said they were unaware of any U.S. military rules for interrogating prisoners that would allow them to be put in stressful positions, deprived of sleep for up to 72 hours, threatened with dogs or kept in isolation for more than 30 days. Images of abuse have appeared in photos of Iraqi prisoners that were taken by American military guards at the prison near Baghdad. Pentagon officials have said the abuses reflected in the photos went beyond approved interrogation techniques. In Iraq on Thursday, Rumsfeld called the controversy surrounding the prison a "body blow for all of us" and said the people who did wrong will be punished. I am going to reveal to you what happened in Abu Graib prison. I spent my Army career working in the Criminal Investigation Department. I know what I am talking about. It is nothing new. A group of sexual perverts were able to hid within the system. They had the opportunity to act out their animalistic perversions, and did so. It was poor leadership that let these perverts have their way. Normally such despicable behavior would be rooted out by the professionals. I would only hope the rush to war was the reason why they got as far as they did? I do remember busting a few lifers who got by with sexual perversion for years, but there were not many who avoided long term concealment. Most of our cases were with the new recruits with less then one year of service. We used to do a pretty good job of processing out the homosexuals, and other perverts before they had a chance to dishonor the military service as has happened in Iraq. I remember one case of homosexuality that was initiated at Ft. Carson where I was stationed that went around the world with leads of partners coming back to us from a Korean lead to another soldier stationed at Ft. Carson. These sexual perverts had to be cleansed from the system. Homosexuals, bi-sexuals, pedophiles, and womanizing rapists were all on the list of undesirables. The dishonor they bring with them ruins every organization that gives them the opportunity to act out their animalistic behavior. The military has known this for a millennium. The Roman Catholic Church just found out! The foolish politicians have tried again and again to force these perverts upon the military. Wiser leadership has protected the integrity of our young men and woman who put their lives on the line. It is for their sakes that integrity must be maintained. What a lesson has been learned on how the entire military with all the tradition of honor can be utterly crushed by just a few sexual perverts who managed to get by the normal screening process. I might mention the screening process is really just catching them committing their first infraction while in the service. We would only ask them to identify other military men who willingly participated in their perverted activities. We would send out feelers to other CID units if the solders were no longer at Ft. Carson. We did not actively initiate witch hunts. We only followed up on what was brought to our attention. That in itself kept us plenty busy. A good 10% of our case loads involved homosexuality alone. We did not humiliate the offenders, but we did put them out of the service quickly. They received medical discharges which was very humane treatment. They were returned to civilian life without stain other then if they chose to tell the truth about the circumstances that caused their medical discharge. What happened in the service was kept in the service, and these fellows had no black mark to follow them around once out of the service. I know we treated those perverts much better then they treated the oath they took when entering military life. I'm afraid the CID, Army Intelligence, FBI, and the CIA all failed to catch these fellows and gals before they had time to commit such filthy perversions on Iraqi prisoners. It most probably was their first offence? One thing certain is that they will not do it again in the military. I would hope a warning is going out to all the perverts to stay out of the military! I would hope the liberal politicians will never be able to destroy our military by passing laws forcing the CID and other military investigative arms from doing their job. We must keep the politicians from destroying the integrity of our fighting men and woman who put their lives on the line to protect freedom around the world. This should never become a political issue. It should be common sense, and the lesson of Iraq should re-enforce that common sense approach to sexual perverts of any hue in the military. Palestinian Authority Chairman Yasser Arafat on Saturday called on his people to "terrorize your enemy" as he bitterly marked the 56th anniversary of the "Nakba" - an Arabic word meaning catastrophe, used to describe the creation of the State of Israel. In a speech broadcast live on Palestinian television, Arafat repeatedly called on his people to be steadfast in their struggle against the Israeli occupation. "Our nation is patient and determined," he said, "which sacrificed its body to defend itself, which was laid bare by the Nakba carried out the international, Zionist and imperialist power, which didn't have the right to allow [the creation of Israel], for those who didn't have the right [the Zionists]. "Acts of sacrifice, determination and revolution have sent a message to the world that Palestine is the homeland of the Palestinian nation and it has no other, and it will not accept an alternative to its homeland," said Arafat. "The warriors of jihad [holy war] have erased the memory of the Nakba and compelled the international community and Israel to discuss the Palestinian issue," the PA chairman went on. "We have proved that the Nakba, which caused harm to millions of Palestinian refugees, is not a fate that we cannot fight, and we proved that through stubbornness it is possible to battle for this homeland and the holy places, and return to them. The aggression of the Israeli occupation is pitted against the force of history." Arafat ended the speech with a quote from the Koran. "Find what strength you have to terrorize your enemy and the enemy of God," he said. The phrase in the Koran refers to Muslims' wars against pagans. It is followed by a phrase saying "if they want peace, then let's have peace." The Palestinian leader has long been accused by Israel of sponsoring terrorism and has been confined to his compound in the West Bank city of Ramallah for more than two years. In September 2003 the Israeli government decided to remove the Palestinian leader "in the way, time and manner which will be determined." Prime Minister Ariel Sharon rekindled the issue during interviews he gave during Pesach, in which he first announced he was releasing himself from his promise to U.S. President George Bush not to harm Arafat physically. Throughout the Gaza Strip and the West Bank, Palestinians marked the 56th anniversary of Israel's founding Saturday, standing with heads bowed as sirens wailed from minarets at noon. Thousands then marched through the streets carrying banners with the names of Palestinian townships now either razed or renamed in Israel. The issue is the Koran, or the Bible! The whole world watches as the God of the Bible battles with the heathen over exactly who's homeland is in question! It is in this our generation that the God of the Bible has reclaimed His right to the only place on planet earth that He calls His own. It is not just Israel. It is the Holy Land. It is the Land of the Bible. It is the Promised Land designated in the Bible for the Jews. Yasser Arafat is the voice of the heathen interlopers who would defy the God of the Bible. His support among the world leaders is astounding! It reflects just how much the world of this generation hates the God of the Bible. Oh how they resist when He begins forcing His holy will on them! The truth of just how much men hate the God of the Bible is being revealed in the Holy Land this very day! The heathen, Islamic, Arab, Palestinians are in the forefront resisting the God of Abraham, Isaac, and Jacob. They boldly follow a policy of terrorism in their frustration as God forces them out of the land that was never theirs from the beginning. The truth is the Palestinian Arabs have no historical claim to the land. It was a no-man's-land before 1948 sparsely populated by a mixture of peoples including Jews and Arabs. The end of World War Two and the holocaust caused the world to make a decision about the surviving Jews who lost everything due to anti-Semitism in the war ravaged countries where they were in dispersion. These Jewish refugees were allowed to return to the Holy Land because the world did not know what to do with them? It was God acting in the affairs of men that brought about the modern State of Israel. It is God working in the affairs of men that has caused the present conflict. It is the Arabs and their Koran that must be purged from the Holy Land. God is forcing this generation into accepting the coming Biblical Jewish Kingdom. They hate Him for this, and would place a heathen State in the middle of His holy Land to forever terrorize any who would follow His leading. The actions of this generation as pertaining to the Holy Land is a testimony of defiance against the Bible, and the Biblical God! Blatant terrorism is the response to God when He forces His will on the Arabs. Soon, He will force His will on the entire planet. Only His commandments, His statutes, and His judgments will be allowed. Men are either going to submit, or resist with a hate heretofore only associated with the wild beasts. Are you submitted to the Biblical Christ? Do you desire His absolutely pure and righteous will be applied to your heart? Only He can produce such desires. It is only the born again who will not hate Christ for coming back to the planet with puritanical righteousness. It is all linked to the Holy Land, and how the men of this generation respond to the God of the Bible! More than 150,000 people demonstrated against Israel's continued occupation of the Gaza Strip on Saturday night in Rabin Square, Tel Aviv. The demonstration was planned a fortnight ago and drew more interest now because it came at the end of a week in which Israel lost 13 soldiers in the Gaza Strip. The demonstrated started at 8:00pm with aminute's silence for the fallen soldiers. Former Prime Minister - and now opposition leader - Shimon Peres noted the demonstration attracted four times more people than all the supporters of the extreme right wing parties. To loud applause and cheering, the opposition leader Shimon Peres told the crowd that 80% of Israeli want peace and just one percent is trying to block it. "We will not allow them," Peres said. "We must not support a puppet government that follows the delusional ideas of the right." "We shall say good-bye to Gaza," Peres declared. He contradicted government claims that there is no Palestinian negotiating partner. "Former Palestinian Prime Minister Mahmoud Abbas and the incumbent Prime Minister Ahmad Qureia oppose terror and want peace," he noted. The head of the Yahad-Meretz party, and co-initiator of the Geneva understandings, Yossi Beilin, said they would support a Sharon proposal to leave Gaza. However, "if you continue to drag your feet, to sacrifice our best sons for naught, we shall not let you be. The great majority in Israel wants to evacuate settlements and believes in an agreement," he added. The demonstrators spilled into streets surrounding Rabin Square but did not attract even moderate orthodox Jews. Some supporters of the centrist Shinui Party that is in Sharon's coalition did demonstrate. God is not influenced by the masses. His Biblical focus has always been on a remnant! Today, even the Jewish masses oppose God's plan to establish His Jewish Kingdom in the Holy Land, at Jerusalem, and on the Temple Mount. Redemption will come to the Jews first, but after the rapture. God will abandon the Great Whore of Apostate Christianity after the departure of the Christian remnant that refused to unite, and caused great frustration by their non-compromising stand on the Bible. These Bible fundamentalists are those who recognized the phony charismatic doctrine that changed the face of Christianity in just one generation. This remnant would not compromise with the apostate Roman Catholic Church, but rather sent out missionaries specifically to the Catholics that they might come out of apostasy, and come to the Biblical Christ. This remnant knows there is no redemption in the Roman Catholic Christ! Soon, the redemptive power of the Biblical Christ will turn the hearts of the Jews to again Biblically worship the God of Abraham, Isaac, and Jacob. A kosher Temple must be built so the Torah can again be literally obeyed. The book of Leviticus will again be the centerpiece of the Torah as it is numerically the center book of the Pentateuch. Blood sacrifice will again be offered, and accepted by the Holy God of the Bible in remembrance this time of Calvary. Jewish hearts will turn to the Christ of the raptured Church of "born again" Christians. He will now be their personal Savior/Messiah. The Great Apostate Church left behind will gnash its teeth! The independent fundamental Jewish settlers are another remnant that causes exasperation to the Jewish masses. Shimon Peres accuses them of being a small 20% of the Jewish population who are trying to block the efforts for peace. The obedience to the Biblical mandate for Jews to occupy and conquer the Promised Land is turned into the hated anti-peace provocateurs. The same charge can be leveled against Joshua, but I doubt Peres would remain consistent by leveling such an accusation toward that generation of Jews? Peres says these settlers are guilty of delusional ideas! The delusion, if that is what it is, comes straight out of the Bible. Peres as well call father Abraham delusional for going to the Holy Land in the first place. It matters not that the great majority of the Jews want the settlers to evacuate the lands already occupied and conquered. What does matter is what God is going to do with the remnant that will make up the coming Kingdom. God has no intention of compromising with the heathen, Islamic, Arab, Palestinians who's animalistic behavior has written new pages in the annals of beastly behavior. The Christian remnant will not compromise with the apostates, and this Jewish remnant refuses to compromise with the liberal secular Jews. The masses are going to die in their efforts to resist what God is doing during this generation in the Holy Land. Only the faithful remnant find victory in the Bible. Numbers are meaningless. The masses perish in their sins as the Biblical record always reveals. Once, only a remnant of eight had victory over the floods. The masses were left behind to face the wrath of God. This time I suspect the remnant of born again Christians will be more then eight. I also expect even a larger remnant of Jews will be victorious through Great Tribulation, and will enter into the land of promise as citizens of the coming glorious Kingdom. Christ is the redeemer of the remnant throughout Bible history. Are you trusting in Him? The real Christ! The Christ of the Bible! Palestinians Flee Gaza Homes; Qurie Appeals to U.S.
RAFAH, Gaza Strip (Reuters) - Panicked Palestinians fled their homes Monday as Israeli forces surrounded a Gaza refugee camp to carry out a threatened mass demolition despite an international outcry. Palestinian Prime Minister Ahmed Qurie pleaded for U.S. intervention in rare talks with a top White House policymaker but received little more than expressions of concern. Shaken by ambushes that killed 13 Israeli soldiers in Gaza, the Middle East's strongest army said it planned first to hit militants and then raze hundreds of houses it says serve as gun nests and possibly dig a moat to block arms-smuggling tunnels. The plan has drawn U.N. and European Union condemnation as it could uproot thousands of Palestinians. The U.N. Relief and Works Agency for Palestine Refugees (UNRWA) says 12,600 Rafah Palestinians have been made homeless by the destruction of homes by Israeli forces since an uprising began in 2000. Angry Palestinian leaders charged that the demolition drive contradicted Israeli Prime Minister Ariel Sharon's plan to withdraw from the occupied Gaza Strip. With scores of Israeli tanks and combat troop carriers ringing the teeming camp in southern Gaza, hundreds of residents piled bedding, furniture, clothes, floor tiles and other items on donkey carts and rickety old trucks and moved out. UNRWA readied four schools with stockpiled food and water and set up rows of tents to take in 1,500 displaced to start. "There is no place for me go. I don't think I will return," said Youssef al-Jamal, 33, removing possessions from his home in the bullet-pocked, cinderblock camp of 90,000 people. After Israel's army chief said "hundreds of houses" would be flattened to widen a security corridor patrolled by troops along the border with Egypt, Qurie accused Israel of planning "ethnic cleansing and collective punishment of innocent civilians." Qurie, in a Berlin meeting Monday with U.S. National Security Adviser Condoleezza Rice that somewhat eased Palestinians' diplomatic isolation from the White House, appealed to Washington to rein in Israel. Despite all the frustrated demonstrations by the liberal secular Jews, God continues moving the heathen out of the way so He can bring in the Coming Kingdom. It amazes me how God uses the tool the liberal secular Jews expect to remove the settlers to instead remove the Islamic, Arab, Palestinians. Balaam once decided to go contrary to God's plan for the Holy Land. It took a jackass to explain to him how foolish it was to go against God! Today, God is preparing the Holy Land for His coming Kingdom. There is no room for the heathen. They must convert, or get out of the way. I would hope Islam will listen to the common sense that even the animals posses when it comes to the creator God. The God of the Bible. It is time for dispensational change. God is again claiming the Holy Land to demonstrate His puritanical righteousness on planet earth. All God need do is manifest His purity on one litter spot of the planet, and all of mankind will come to Him. That spot according to the Bible is in the Holy Land, at Jerusalem, and on the Temple Mount. Men will come not in adoration, but in hate! Armageddon is what the Bible says will be the end of future opposition! This generation wants the heathen, animalistic, Arab, Palestinians to occupy most of the Holy Land. They secretly hope such a forever State placed in the Holy Land will forever thwart the God of the Bible from accomplishing His future Biblical plan for a coming Kingdom! It just is not going to work! This generation wants freedom of religion. Freedom to allow the Palestinians to forever torture the Jewish civilian population in the name of Allah. It does not want an uncompromising righteous Jewish Christ as it's King. This is the Biblical Christ, and all other christs are false! Only the Biblical Christ can save! All others give only phony promises of twisted religionists that will never be fulfilled. The Great Whore of Apostate Christianity has deceived this generation. Only a remnant will be raptured, and only a remnant of Jews will lay the foundation for the next dispensation. My friend, do not let the beasts of Apostasy lead you to death and destruction. Let common sense lead you to the Bible, and let the pure, holy, righteousness of the real God point you to the only sacrifice able to atone for sin. Go to the Christ of the Bible before it is too late! BERLIN -- Russia will finish a nuclear reactor in Iran despite technical complications, unresolved commercial issues and strong objections from the United States, a senior official said Friday. Sergei Antipov, deputy head of the Federal Nuclear Power Agency, said strict UN controls will ensure no fuel can be diverted to build a nuclear bomb. The United States accuses Iran of trying to build such a bomb under the cover of what Tehran insists is a peaceful nuclear energy program based around the planned $800 million Russian-built reactor at Bushehr. TAntipov said Moscow will supply fuel for the reactor only on the condition that spent fuel be returned, although he said the commercial terms for this have not yet been agreed with Iran. "Definitely, that is our demand. Otherwise we won't supply it," Antipov said in an interview during a visit to Germany. "The only question that's being discussed is price." He said the Iranians are arguing that Moscow should sell the fuel more cheaply if it is going to take it back at the end of the reactor cycle. "It's a commercial issue, not a defense or technical question," he said. TAntipov also said construction at Bushehr, whose launch is scheduled for 2006, is being slowed down by technical factors. "There are some technical complications connected to the fact construction of this station started many years ago and a lot of equipment was supplied by Germany. Now, to activate that equipment -- a lot of it is past its expiry date -- it needs to be rechecked and retested," he said. "All the delays are connected with purely technical engineering questions." Iran was found to have made omissions from what it had said last October was a full declaration of its nuclear activities, and the head of the UN nuclear watchdog said earlier this month that the world would not wait forever for it to "come clean." TAntipov said the watchdog, the International Atomic Energy Agency, maintained strict controls on Iran's nuclear activities at all stages. Material must not be outside control for a second. It's an absolutely closed fuel cycle. At no point can fuel be diverted or extracted for nuclear weapons," he said. He said objections to Russia's involvement in building Bushehr were based on commercial motives, not security concerns. ""All the accusations against Russia in my personal opinion arise from our unscrupulous rivals in this field. If Russia is forced to give up the construction of the reactor in Iran, I assure you that in a very short time this reactor or reactors will be built by other countries," Antipov said. I suspect an overpowering movement probably led by liberal, secular, Jews will call for a nuclear free zone for the Middle East. I know a phony peace is coming to the Holy Land, and the Jews are going to foolishly rest on gentile promises for a secure peace. I suspect Israel will be duped into dismantling their nuclear weapons on a promise that the Islamic nations not enter the nuclear club? Somehow, the gentiles are going to get Israel to abandon their nuclear deterrents. The Bible is clear that when Islam invades Israel, it will be a nation at rest. The Jews will be dwelling safely in un-walled cities. My guess is that the present security fence will be removed, and some ungodly compromise will be worked out with the heathen, Islamic, Arab, Palestinians. It will be then that Islam will strike. The three pronged Islamic attack is classic. They come from the North, South, and East pushing the Jews in a pincher movement with their backs to the Mediterranean Sea. There will be no Dunkirk rescue for the Jews. The gentile world does nothing to help according to the Bible. It appears to be goodbye to those pesky people who caused the gentile world so much trouble. I suspect the God of the Bible will be blamed as the instigator of the invasion by Islam. A declaration by two Old Testament type Jewish prophets from Jerusalem to build the last Jewish Temple on the Temple Mount will be all the excuse Islam will need to invade. I suspect after God destroys the invading Islamic Armies that the antichrist will come on the scene with a new peace treaty from the Western world of gentiles agreeing to let the Jews build their Temple in the aftermath of this great defeat. It will be another phony treaty to be broken by the gentiles in only 3-1/2 years. Iran is the eastern prong of this "Last Jihad" Islamic Invasion described in Ezekiel 38 & 39. It will not be nuclear weapons that destroy the invaders on the mountains and in the fields of Israel. It will be the God of the Bible! The Koran will be tossed on the dung heap along with the abominable Allah and his false prophet Mohamed. Another gentile deity will rise in the place of Allah. It will be the antichrist himself, and his false prophet who will take control of the Western powers, and in so doing control the whole world. Another anti-Semitic wave of hate will flood the planet. The Bible says it will pale all others. Jewish blood will flow at the hands of this beast who will use Christ as his motivation (antichrist), and the left behind Apostate Christian Church will give him their support. Today, Apostate Christianity demands that Jerusalem should be for them, not the Jews. They are ready to chose the antichrist rather then the King of the Jews as their leader. The lessons of the Islamic disaster go unheeded by this generation of the Great Tribulation. Do not let the lessons of the Bible go unheeded in your life. Go to the Biblical Christ for salvation today. Tomorrow may well be too late! Today is Jerusalem Day, commemorating the reunification of Jerusalem, Israel's capital, and bringing it under full Jewish sovereignty for the first time in almost precisely 1,900 years. The Jerusalem Municipality's website <"www.jerusalem.muni.il/jer_main/f1_main.asp?lng=2"> states, "For three millennia Jerusalem has been the heart of the Jewish people. Although throughout the years the city was under the rule of many nations, including the Assyrians, Persians and Romans, Jerusalem is the enduring center of Jewish belief and identity. It has only ever been a capital city under Jewish rule. More recently, the Ottoman Turks ruled Jerusalem until December 1917, when it came under the control of the British. "On November 29, 1947, the United Nations decided that the Land of Israel would be divided into two separate countries - one Jewish and one Arab. Jerusalem would belong to neither, holding special standing under the auspices of the U.N. The British mandate ended on May 15, 1948, at which time 7 Arab states declared war on the newly created Jewish State. The cease-fire ending Israel's War of Independence left Jerusalem a divided city, with Jordan retaining control of the eastern portion encompassing the Old City and the Western Wall, and Israel retaining the western side. The resulting border was 7 kilometers long from north to south, dividing neighborhoods and even private property. A concrete wall was erected on the Israeli side against snipers. "The Six Day War began on June 6, 1967. On June 8 - the 28th of the month of Iyar, according to the Hebrew calendar - Israeli forces broke through Lions' Gate to the Old City. On June 28, the Government of Israel proclaimed the Reunification of Jerusalem, the Capital of Israel." Jerusalem Day is also connected with the Prophet Samuel and Rabbi Kook; click here for more. Oh Jerusalem! Mount Moriah marks Jerusalem. 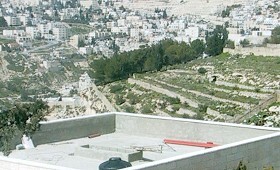 It is a saddle twin peak with the higher peak the Mount of Olives, and the lower peak the Temple Mount. The Kidron Valley separates the two peaks in gentle slopes. The East gate (Golden Gate) stands in the old wall of Jerusalem in straight line between the Mount of Olives (outside the city), and the Temple Mount (inside the city). Only the Jews have a Biblical passion for this special City of God. It was only to the Jews that the God of all creation manifested His presents. It was in the First Temple which was the centerpiece of Jerusalem. The Bible says God is going to manifest His presents once again in the Last Jewish Temple yet to be built on the Temple Mount. Ezekiel 40 - 48 gives an explicit blueprint of that soon coming Temple. The next Jewish Temple chronologically follows the "Last Jihad" Islamic invasion of Israel in Ezekiel 38 & 39. It makes sense that Islam must be crushed before another Jewish Temple can be built. The chronology was clear to God when He gave Ezekiel the vision. Ezekiel saw the Glory of God leave the First Temple because of the shame of the Jewish people, but God revealed to Ezekiel a better day. Another generation that would turn back to their God. A generation worthy of having the Glory of God in their presents once again. The shame of main stream Christianity is leaving the Charismatics trivialize the presents of God. The laughing revivals are a mockery to the awesome presents of God in the midst of His people. It meant death to any Jewish priest who mocked His presents in the Temple. It means separation of the wheat and tares to this generation of Christians. It is the same Mount of Olives that Zechariah reveals the return of the Glory of God first touching down on the Mount of Olives moving across the saddle through the East gate to the Temple Mount where God will be King over all the earth. Today, the importance of the City of God is in the news. The last Jewish Temple must be built on the Temple Mount. The heathen shrines must be bulldozed into the Kidron, or the perpendicular adjoining Hinnon valleys. It is all in preparation for the coming Kingdom of God. This will be the next Biblical dispensation so clearly revealed in the pages of the Bible. Oh Jerusalem! your glory will soon be here again! While the US was not vetoing a UN condemnation of Israel for its anti-terrorism operation in southern Gaza, the U.S. found itself in the same position as Israel: having to defend itself against claims that it had killed innocent Arabs. Around the same time as the United Nations was condemning Israel for its anti-terrorism operation in southern Gaza, with tacit U.S. support in the form of an abstention, the U.S. found itself in the same position as Israel: having to defend itself against claims that it had killed innocent Arabs. Israel was accused yesterday of having killed up to 20 Arab civilians during a demonstration - that number has since gone down to "around ten," while according to Israel, the number is just seven, including five armed terrorists - while the U.S. now stands accused of having strafed an Iraqi wedding party, killing some 40 civilians. American Deputy Ambassador to the UN James Cunningham said after the UN vote, "While we believe that Israel has the right to act to defend itself and its citizens, we do not see that its operations in Gaza in the last few days serve the purposes of peace and security." Regarding the Americans' bombing of the wedding party in Iraq, U.S. officials said that the target was a suspected safe house for terrorists, that U.S. planes had come under fire, and that the bombing was had been carried out "within the framework of our rules of engagement." Cunningham explained that the U.S. did not vote in favor of the anti-Israel resolution because it did not mention that which Israel says is the reason for the offensive: the arms-smuggling into Gaza from Egypt and the ongoing terrorist attacks against Israel. Though some reports said that this was the first time "in many years" that the U.S. did not veto an anti-Israel resolution, in fact the last time was only 20 months ago. On Sept. 24, 2002, the UN Security Council passed a resolution demanding that Israel withdraw its forces from PA-controlled cities; the U.S. abstained. The Security Council ignored the explanation provided by Israel's Ambassador Dan Gillerman. "The whole of Gaza, and Rafiach in particular, is on the verge of becoming a missile base aimed at Israel's cities and civilians," he said. "What would the international community have Israel do? Just sit back and wait for this horrific scenario to materialize?... The suffering of the Palestinian population is a direct result of Palestinian terrorism aimed at innocent Israelis, and the need for Israel to protect its citizens from these abhorrent attacks. Rather than criticizing Israel for damaging private property, those truly concerned for Palestinian welfare should instead demand that the terrorists stop using homes to shield their illegal operations." Imagine the UN passing a resolution telling God to quit causing trouble for this sin loving world! Imagine the UN passing a resolution against the Bible because it mandates the Jews to occupy and conquer their Promised Land! This generation is ready to reject the Biblical Christ, and follow the antichrist right now! These one sided resolutions by the gentile judges of this generation clearly indicate the direction worldly justice is now entrenched. The very opposite direction of Biblical justice that condemns the Islamic, Arab, Palestinians as being as guilty as the Canaanites of old during the days of Joshua. These are a wicked people who have no rights to the Holy Land according to the Bible. The gentile judges have ruled just the opposite! The Palestinians openly target civilian Jews for terrorism with no resolutions by the UN, but when Arab civilians are killed unintentionally by Israel resolutions become legion. It is a one sided justice system now operating during this generation that can only open the door for the antichrist to make his entrance. It is the environment needed for evil to triumph in a twisted system of worldly righteousness. A system that would justify forever a heathen Islamic State in the middle of the Holy Land! God in His sovereignty has chosen the Jews over the gentiles. It was that way throughout the last dispensation as revealed in the Old Testament, and the Bible says it will be that way in the next dispensation. It is for the wickedness of the Palestinian people that God is causing their removal from the Holy Land. It is not for the righteousness of the Jews! Redemption is yet to come to this generation of Jews. They are still stiffnecked. Be clear that were the Jews judged by the same standard as the Palestinians they also would be purged from the Land. It is the choice of God to place whom He desires in the Holy Land. God did not chose the Pope, or the Evangelicals. God chose the Jews! The justice that would forbid God His sovereignty is no justice at all. This generation must either submit to the authority of the God of the Bible, or face His wrath! The worm does not dictate to the creator. The worm does not pass resolutions of phony justice condemning the sovereignty of the God of the Bible! The sovereign God of the Bible has declared there is only one blood sacrifice able to wash away sin. Be certain you are trusting in the Biblical Christ for your personal atonement. The phony christs of religion are powerless. Any christ that can't raise the dead, or restore missing limbs is antichrist. Do not be fooled by magic rather then miracles. Receive only the Biblical Christ, and reject all others. This is the choice the sovereign God has given you! The United Nations Security Council passed a resolution Wednesday night calling Israel to halt demolition of Palestinian homes in the southern Gaza town of Rafah, according to The Jerusalem Post. 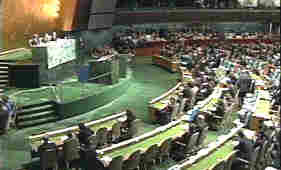 The resolution was adopted after the United States abstained from the vote, after significantly watering down the text. After Wednesday's vote, Israeli representative, Dan Gillerman, said that of the eight Palestinians killed yesterday in Rafah, up to five were armed gunmen, and that Palestinian attempts to portray the deaths as teenagers and children were part of a "misinformation and disinformation" campaign. "The whole of Gaza, and Rafah in particular, is on the verge of becoming a missile base aimed at Israel's cities and civilian population. What would the international community have Israel do? Just sit back and wait for this horrific scenario to materialize?" Gillerman said. The Security Council, he noted, "has never dealt with the dangers to peace and security of smuggling arms through the tunnels of Rafah from Egypt. It did not meet to condemn the horrendous desecration of the bodies of Israeli soldiers, young men who were killed during a defensive operation to dismantle these tunnels. It did not come together following the hijacking of an UNRWA ambulance by armed elements in Gaza last week. It did not stand up against the murder of a mother and her four daughters in the Gaza Strip or the continuing cultivation of a culture of hate and destruction by the Palestinian leadership." Unidentified gunmen in Ramallah – thought to be linked to one of Yasser Arafat’s disparate armed security factions -have opened fire at the offices of Jibril Rajoub, PA Chairman Yasser Arafat's National Security advisor, sources in the city told The Jerusalem Post on Tuesday. No one was hurt in the attack, the first of its kind against Rajoub, but it came hours after a heated altercation with Arafat over the need to implement reforms in the PA security forces. Although no group has claimed responsibility, some in Ramallah said it was clearly linked to the standoff with Arafat. It is hard to understand how the road map of a two State solution for the Holy Land can be linked to peace with this Palestinian culture? The leopard is not going to change its spots! It is a false premise that a culture based on hate will suddenly become civilized when given self-government. God has given Israel both the power and justification to expel this heathen, Islamic, Arab, Palestinian culture from the Holy Land. So far, Israel has lacked the political will to do so. I suspect the spiritual will needed to cleanse the Temple Mount, Jerusalem, and the Holy Land of these heathen will not come until the two Old Testament type prophets of Revelation chapter 11 come on the scene. Until then, the confusion that is rampant in Israeli politics over how to deal with the Palestinians will continue. These Palestinians could not wait for the foolish withdrawal plan by Ariel Sharon to take place. Their response is to make the Gaza a missile launching site in anticipation of the Israeli withdrawal. Hardly a move to peace! What is happening today in the Gaza is exactly what will happen when the gentile world gives this culture of hate a State of its own! It will only mean a larger launching pad for hate against the Jews. The Palestinian leadership reflects this hate in how they conduct their internal politics. It is either do what I say, or be intimidated with death. What a State this will be for the world to place in the Holy Land. Only a miracle could change Palestinian hate for Jews taught from cradle to grave into a love for their neighbor. Only a miraculous change to the heart could ever bring peace from this culture toward a Jewish King. Only by starting life all over again could any hope of real peace be envisioned between Palestinian and Jew. That is exactly what the Biblical Christ offers to those who are 'born again!" Is this the miracle working Christ you are trusting for salvation? Has the miracle of a changed heart taken place in your life? Or, are you trusting in a false religious christ that has no power? Do you trust in magic rather then miracles? Do you evidence emotion rather then concrete heart change? Does the Biblical Christ dwell in inner man of your heart? The detestable and abominable are all going to be left behind. The Bible calls them apostate! Their spots never change. JERUSALEM – It was an especially bloody week in the unrelenting mini-war between Israeli troops and Palestinian terror militias over cross-border arms smuggling tunnels in southern Gaza, but the Multinational Force and Observers charged with monitoring weaponry on the Egyptian side of the border seemed no where to be found. Israel this week launched “Operation Rainbow,” a major incursion into the Palestinian town of Rafah to finally cut off the flow of illegal weapons through tunnels dug underneath the narrow IDF-patrolled Philadelphi corridor separating Gaza from Egypt. The move came after 7 Israeli soldiers were killed by Palestinian militias defending tunnels the IDF is now calling the “oxygen” of the intifada. In addition, Israeli intelligence was warning that an Iranian shipment of Katyushas, Sagger anti-tank rockets and other missiles had arrived on the Egyptian side of the border, awaiting transit through the myriad of tunnels. So far, the four-day old Israeli operation has claimed some 40 Palestinian lives, most armed men trying to protect the lifeline of their terrorist enterprise. But several civilians pressed towards the front line of battle have also died in the intense fighting, amid conflicting versions of the circumstances surrounding their deaths. In addition, dozen of buildings have been razed by the IDF to cover up tunnel entrances and widen the Philadelphi security corridor to make tunneling more difficult. With the death toll mounting and Palestinians crying “massacre” once more, international pressure built on Israel to end the sustained incursion into Rafah. But IDF Chief of General Staff Lt.-Gen. Moshe Ya’alon insisted his forces could not withdraw until they closed down all the tunnels, lest the shipments of rockets and missiles waiting in the Sinai make it into the Gaza Strip and threaten Ashkelon and even IAF aircraft overhead. It was a rare moment of candor for a senior Israeli official. For over three-and-a-half years of the violent intifada, Israeli leaders have largely downplayed Egypt’s complicity in the tunnel smuggling operations, saying "they are doing, but could do more." Likud MK Yuval Shteinetz was perhaps the most vocal critic of this policy, but his was a lone voice. Israeli cabinet minister Natan Sharansky also turned up the heat by claiming that 90% of the Palestinian terror arsenal in Gaza comes through the Rafah tunnels. Egyptian officials have long denied any official involvement in the smuggling activity, while conceding some local military commanders may be taking bribes to look the other way. This has been a terrible week in Israel. The world prefers to believe the lie that the Jews massacred the Palestinians in the Gaza. The truth about the Palestinians importing the shoulder mounted missiles so effectively used against Americans in Iraq is not the story that resonates. The Palestinians have learned a lesson from the Iraqis, and intend to flood the Holy Land with those Russian made hand held missile launchers. The secular Jewish government found itself shooting its own foot. On one side of its mouth it says we will withdraw from the Gaza while on the other side it must stop this latest threat from the Gaza. It appears the right hand does not know what the left is doing? This is probably more true then most would like to acknowledge. The God of the Bible has long used confusion among foolish men to accomplish His will. It began at the Tower of Babble, and continues to this day. There is no confusion when it comes to the Bible. The record is clear. Men are sinners by birth, and in need of a Savior. The God of the Bible promised this Savior would come through the Jews. The New Testament is confirmation that God kept His Promises in the Old Testament. Jesus Christ was born at Bethlehem in the linage of King David just like the Old Testament said He would. Both Testaments record another dispensation coming. A Kingdom ruled by the Jewish Messiah. Today, the Jews are miraculously back in the Holy Land. Only the willingly blind can't see God is preparing this generation for the coming Kingdom. There is no confusion for those who have the Biblical Christ dwelling in their heart. ANKARA, 22 May 2004 — Israel’s heavy-handed policy against the Palestinians has cast clouds on its alliance with Turkey, with observers questioning whether the “strategic” partnership of the two countries is still intact. Leading the army of critics, Turkish Prime Minister Recep Tayyip Erdogan Thursday condemned as “state terror” the killings of civilians in the Rafah refugee camp, while Foreign Minister Abdullah Gul warned Israel that relations would suffer. More than 40 Palestinians have been killed since the Israeli army began its operations in Rafah, in the southern Gaza Strip. “The killing of civilians in Rafah and the harsh statement with which Erdogan reacted paved the way for the highest tension in bilateral relations in recent years,” the mass-circulation daily Milliyet wrote yesterday. Ankara’s warning to Israel came atop other signs that relations might be on the skids. In April, a visit by Israeli Deputy Prime Minister Ehud Olmert was postponed without explanation, while in November Erdogan turned down a request by Israeli Prime Minister Ariel Sharon for a brief visit, citing his busy schedule. Following the assassination of Sheikh Ahmed Yassin in March, Erdogan accused Israel of perpetrating a “terrorist act” and angrily conceded that Ankara’s plans to mediate between the Arabs and Israel was “messed up”. There have also been reports that Ankara may sideline Israeli companies from lucrative defense tenders, though these claims have been denied by officials. “It is impossible for Turkey to keep silent at what Israel is doing today... Turkish leaders believe that the resolution of the Israeli-Arab conflict is a precondition for combating terrorism and bringing democracy to the region,” Mensur Akgun, a scholar of international relations, said. Erdogan’s government, which has its roots in a banned Islamist movement, is also under pressure from an electorate highly sympathetic to the Palestinian cause, he said. Hundreds of Turkish protesters — ranging from Islamist activists to left-wingers — took to the streets yesterday to denounce the bloody crackdown in Rafah. A crowd of some 800 people gathered outside a major mosque in Istanbul after Friday prayers, burning an Israeli flag and chanting: “Israel, murderer, leave Palestine.” Protests were also held outside Israeli diplomatic missions in Ankara and Istanbul. Erdogan, meanwhile, underlined that his reaction was not prompted by religious but humanitarian considerations, directing his anger at the hard-line Sharon. “The current Sharon administration takes governmental decisions to kill individuals. And they declare that this will continue. Unless we change this, we can never bring peace to the Middle East,” Erdogan told the Wall Street Journal. “Of course, we are not going to change our relations with the people of Israel just because of our approach to the Sharon administration,” he added. The operation (named "Operation Rainbow") which is aimed to cut off supplies to the terrorists' factions that are being smuggled in from Egypt and destruct the terror base being used against Israeli soldiers, is going into its second week and is clearly a success. In an abandoned building located 600 meters from the border with Egypt in the Brazil neighborhood, soldiers uncovered an eight meter-deep tunnel and a 40 kilogram bomb nearby it. The tunnel opening was covered over with a thin layer of cement. Last week soldiers uncovered a tunnel opening large enough to smuggle through RPG rocket grenades. Since the beginning of the year, IDF units have uncovered 12 tunnels on the border near Egypt. A total of five houses have been demolished, and all were structures used by terrorists to shoot at troops or detonate bombs. So far 40 terrorists have been killed, including the local Hamas commander and six civilians. Here is the terrible massacre that caused the Islamic world to go into such turmoil. They do not want to hear the truth. Massacre is all they want to hear, and massacre is what the Islamic press gives them. A lot of the American press does not want to know the truth either. Massive demolition was copied from the Islamic press as if 5 houses make for a massive demolition story? Truth is not what this generation wants to hear. God has brought the Jews back to the Holy Land for the purpose of dispensational change. The times of the gentiles is ending, and the Kingdom age is about to start. The Christian Church must step aside for the last Jewish Temple. Islam must be crushed so Ezekiel's Temple can be built on the Temple Mount. The conflict in the Holy Land is heading for a phony peace. How it happens is being played out in the politics of the Middle East this very day. The Jews have a final lesson to learn about trusting the gentiles rather then the God of their fathers. I suspect Israel will be teased into dismantling their nuclear deterrents because of gentile wiles. The Jews will falsely feel secure in the Holy Land through agreements made to them by the gentiles. This false security will lead to the greatest Islamic invasion of the Holy Land in all history. The great grandson of Noah, Togarmah, settled in what is now modern Turkey. Turkey is revealed in Ezekiel 38 & 39 to join in with the northern prong of the Islamic invasion. The end of the invasion will be the greatest destruction of an invading army ever recorded. Ezekiel 39 can only mean an open door for the Jews to build their long delayed Temple on the Temple Mount. No amount of misinformation is going to stop God from ushering in the coming Kingdom. Turkey is headed for the dung heap of nations that thought they could ignore the god of the Bible. The present threats by this Middle East power against the apple of God's eye will soon result in their destruction. A short film prepared last month by Palestinian Media Watch shows two significant and alarming phenomena in the ongoing Oslo War: The horrifying extent of Palestinian incitement and hatred to Israel, and the Arabs' intention to utilize the methods that led to Israel's retreat from Lebanon to bring about the same in Judea, Samaria and Jerusalem. An English-language film by Palestinian Media Watch, entitled, "Ask for Death." Containing some of the same selections as the Hebrew version, it can be seen at "www.pmw.org.il/new/". The Hebrew-language film includes examples of formal and informal educational frameworks, as well as televised plays, religious speeches, and more. Some excerpts from the film were described in Arutz-7's report of last Thursday, May. 20 ("www.israelnationalnews.com/news.php3?id=62783" and "www.israelnationalnews.com/news.php3?id=62784"). "The Jews are Jews, whether they are from Labor or Likud. They are all Jews, and there are no moderates or those who want peace among them, because they are all liars! They should be slaughtered, and they should be killed... The Jews are like a spring. As long as you step on it, it doesn't move. But if you take your foot away from that spring, it will hurt you and punish you!" "I was very moved when a young boy said to me, 'O Sheikh, I am 14, I have four years left, and then I will blow myself up amidst the enemies of Allah, I will blow myself up amidst the Jews.' I said to him, 'O my little son, may Allah allow you to merit Shehada [holy martyrdom].' ... We will blow them up in Hadera, we will blow them up in Netanya and Tel Aviv, [and] Allah will give us control over this rabble. The only thing that will scare them will be the color of our blood amidst their filthy nation; it will scare them only when we blow ourselves up, willingly, amidst them... We will enter Jerusalem as conquerors, and Yaffo as conquerors, and Haifa as conquerors, and Ashkelon as conquerors..."
The film includes clips from Palestinian TV productions, designed to arouse feelings of vengeance and hatred, that show Jews burning Palestinian children in ovens and Israeli soldiers gunning down lines of Arab women and men. "Nothing is more precious to us than Al-Aqsa... Shake the ground, lift up the rocks!... You won't leave safely, o Zionist, from the volcano of the rocks of our land. You are the target in front of my eyes [picture of soldier bleeding in his face], and I will welcome my death as a shahid." On the other hand, scenes of "Al Aqsa Paradise" are often shown on PA television. A shocking scene shows pictures of children playing and giggling, while a laughing girl rides high on a swing right out of the picture - and when she returns on the downswing, the girl and the swing turn into a rocket-like flame; the girl continues to giggle. Other children's toys are also shown on fire. Israeli soldiers are then shown abusing an elderly Arab man and a youth, followed by a stark picture of a gun being shot. Summing up the message, an Arab youth, 12-13 years old, is shown presenting his clear philosophy: "We must expel all the Israelis from Palestine, for there is no such thing as the State of Israel in the whole world: the Israelis are from Holland, the U.S., Iran, and from Arab nations and from everywhere. They came to take away Palestine: Tel Aviv, Jaffa, Haifa, Ramle, Acco. All these cities belong to Palestine. We hope, hope, hope, and I emphasize this word, that the Arab nations and the nations of the world will stand by us and will expel the Israelis from here so that we can live in peace and security." One of the last scenes in the Palestinian Media Watch clip is of a high school graduation of this year, in which the students sing and dance for the destruction of Israel. The words of the song/dance are: "From Jerusalem to Gaza and Palestinian Shechem, from Beit Hanoun to Baka Al-Garbiye, from Ramallah, Al Bireh, Haifa, Jaffa and Ramle - we don't want any substitute, even if they give us Paradise. We will live and die just to restore our homeland... My weapon is the rock and the knife; I have vowed, Palestine will yet return." This heathen, Islamic, Arab, Palestinian culture ranks with the worst cultures history has ever recorded. The only reason the Nazis would rank more vile is because they had the power to institute their hatred against the Jews, and the rest of the world. The Palestinians have been restricted. Once a Palestinian State is forever established in the Holy Land, those restrictions will be removed. The horrors of Palestinian teaching will have no bounds as applied to their hated neighbor. A nation of suicidal terrorists will be released on the Holy Land to forever make sure nothing holy can ever get a foot hold. This is not the Biblical plan for the Holy Land. The gentile world is putting a death sentence on the Palestinian Arabs by placing them in direct conflict with the God of the Bible. King Herod of old tried to stop the Biblical plan for Christ. He thought his plans for the Holy Land were all that mattered. It was his death sentence as worms ate his body from the inside out. The end of this Palestinian State in the middle of the Holy Land is a forgone conclusion. They have seared the conscience of their children so repentance with the God of the Bible is impossible. As a culture, they have moved into abomination territory in just one generation. It takes no revelation from God to predict the same fate of the Arian Nazis is coming to the Arab Palestinians. The God of the Bible has only one plan. That plan is Jesus Christ. He is coming again to the Holy Land, at Jerusalem, and on the Temple Mount. The fate of all who oppose will be the same as old Herod the king. A terrible death, and eternal torment! Won't you come to the Biblical Christ for salvation before it is too late? PARIS, May 25 - As the Europeans haggle over the final wording of their first constitution, they are bedeviled by a three-letter word: God. Mind-numbing arguments over budget rules and weighted voting can be delegated to technocrats. The issue of whether the most ambitious document in European Union history should include a reference to the Continent's Christian heritage is different, an emotional, theological wrangle over the meaning of culture, history and faith. "Of course, we have a Judeo-Christian past, but the constitution is inspired by a heritage that is cultural, religious and humanist all at once," Michel Barnier, France's new foreign minister, said after a news conference at the Foreign Ministry on Tuesday. He made clear that France would not bend to new pressure to inject religion into the draft, noting that the constitution should be "secular." The current wording, he added, is "well balanced." But with the entry of 10 new members into Europe this month, many of them predominantly Catholic, positions have hardened. The one issue European officials seem to agree on is that there will probably be no agreement on religion before a June 17 summit meeting in Brussels, where the constitution is scheduled to be completed. Last Friday, the foreign ministers of seven of the 25 European Union member countries, including two old members (Italy and Portugal) and five new ones (Poland, Lithuania, Malta, Slovakia and the Czech Republic), sent a brief letter to Ireland, the current holder of the European Union presidency, calling for a last-minute conversion. "The issue remains a priority for our governments" and "for millions of European citizens," the letter said. The letter urged "a reference to the Christian roots of Europe," adding in less than perfect English: "The amendment we ask for is aimed to recognize a historical truth. We do not want to disregard neither the secular nature of the European institutions nor the respect of any other religious or philosophical belief." Granted, the seven may have meant no disrespect. But they know well that Pope John Paul II is firmly on their side. Earlier this month, the 83-year-old pope welcomed the accession of the 10 new member states to the European Union and underlined the Christian values on which the group's unity was based. At a meeting of European Union foreign ministers in Brussels on Monday, the group of seven issued the text of their letter to their colleagues. "We are not talking about a reference to Christian values, but to Christian traditions - hence to a historical fact that no one can change," the Polish foreign minister, Wlodzimierz Cimoszewicz, said at a news conference in Brussels. The week before, Italy's foreign minister, Franco Frattini, said that all that the seven were asking for was "a small inclusion in the text" that "would not alter the preamble too much." But other governments have insisted that the preamble of the current draft treaty goes far enough. In its present form, it states that the European Union draws "inspiration from the cultural, religious and humanist inheritance of Europe." Apparently in a gesture to Europe's Muslims and Jews, Foreign Secretary Jack Straw of Britain warned at the Brussels meeting on Monday against singling out religious tradition. "If we were to go down the road of making specific reference to one religious tradition, we have to bear in mind other religious traditions and reference to them as well within Europe," he told reporters. In his comments Tuesday, Mr. Barnier agreed, saying that the current wording reflected Europe's "pluralism." Spain, meanwhile, which had argued vociferously for the God-and-Christianity position, abruptly shifted sides when the Socialists swept aside the center-right Popular Party in general elections in March. The text, Spain's new foreign minister, Miguel Ángel Moratinos, told RFI radio on Monday, "is perfect." He added, "Spain is a Catholic country, but at the same time I believe that in this European constitution our government is rather secular, and in this sense we want to respect the text as it currently stands." Foreign Minister Joschka Fischer of Germany pointed the finger at others. His own government, he told reporters on Monday, is willing to compromise, but several member states "are not prepared to go beyond" the current draft. As a result, he said, "I dare to prophesy that we will have an unchanged situation on this point." Mr. Barnier, by contrast, declined to play prophet, saying, "When we speak of God, we should never say never." 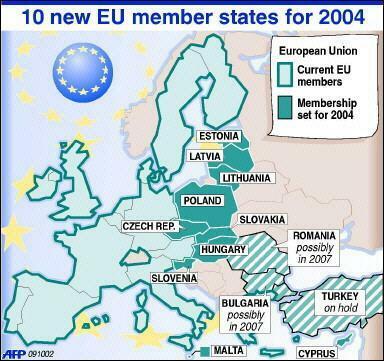 The European Union is clearly anti-God, anti-Bible, and anti-Christ. The only claims to Christianity it even remotely will consider is that of the Apostate European Roman Catholic Christian Church. The Church that beyond question will be left behind after the rapture! It is impossible, or at least it should be impossible, for anyone not to see dispensational change is here. After the rapture, the US will join the other Western Nations in this anti-God, anti-Bible, and anti-Christ attitude. The left behind Apostate Whore of American Christianity will quickly align with the Europeans giving the antichrist his throne of power over the entire world. It will be out of the Western world that the antichrist will be able to control the economy of the world forcing all men to worship him or die. My friend, I hope you can see the signs of our generation. What makes us unique beyond all previous generations since the last dispensational change is that the Jews are back in the Holy Land, and have the sovereignty of a State of their own. The world is quickly moving into an anti-Bible mode that challenges everything God has written. This generation does not want the Bible! What they want is freedom to sin! They want everyman to have the freedom to chose whatever anti-Bible religion they could want. Only Apostate Christianity is acceptable to the Europeans, and that only minimal. Secularism is clearly the desire of this generation. All ties to God, and government must be broken. Liberal bias will soon rule the future of this generation. Humanism that has no need for God is the ultimate goal. It has already conquered Europe, and a large portion of America. Half this nation is ready to join with the French, Spaniards, and Germans to make a humanistic secular society that would vote out both God and His Bible for selfish, sinful ends. These are the folks who want one of the worst cultures recorded in the annals of history to have a forever State in the Holy Land. What is astounding is how much of American lukewarm Christianity agrees with this secular solution to the Middle East Crises. The spirit of antichrist is alive and well among the professing Christians of this generation. The more God forces dispensational change on this generation, the harder hearts will become. The snickering going on today as men purposely leave God out of all their plans will quickly turn to vicious hate as God forces the world to accept His will as revealed in the Bible. The resistance to Jewish sovereignty over the Holy Land is reflective of the resistance to God and the Bible. The stage is set. The world is ready. This generation does not want God, and the Bible. This generation chooses antichrist! NEW YORK - Expressing views that may go unnoticed amid the headline-grabbing violence in the Mideast, 76 percent of Israelis and Palestinians favor a two-state solution to the Arab-Israeli conflict, according to a poll of people on both sides. That finding was offered Tuesday by leaders of OneVoice, a privately funded group that aims to promote peace in the Mideast. While preliminary, they said, the survey suggests that giving ordinary citizens an "active role" might help end the region's 60-year cycle of bloodshed. Meeting with reporters in New York, the group's founder-president, Daniel Lubetzky, and Mideast regional director, Mohammad Darawshe, said their ultimate aim was to survey a quarter-million people, to show there is a "silent majority" on each side that favors mutual agreement instead of violence and extremism. "Every Palestinian and Israeli says they are for peace, but the people have not been held accountable for their beliefs," said Lubetzky. "What's happening now is that 40,000 people stood up and said this is what they want." The survey was conducted in the past two months among residents of Israel and the West Bank using questionnaires designed to draw specific answers to 10 basic questions about the conflict. So far, 25,000 responses have been recorded, with another 15,000 awaiting tabulation. Survey workers questioned people in streets, homes, schools, workplaces and refugee camps. Amid tension resulting from violent acts by Palestinian extremists and armed responses by Israel, the workers "were sometimes threatened, hit or spat on," Darawshe said. "It was not always a receptive audience." The questionnaires relied on a complicated system under which respondents endorsed a statement with which they agreed or broke down a negative answer by points. "Even if they say 'no' to everything, it yields data that is very valuable," Lubetzky said. In the region, where 65 percent of the population is 34 or younger, nearly half the respondents were of high school or college age, 15 to 24. The most significant finding was that among the 23,000 Palestinians and 17,000 Israelis queried, about 76 percent on each side endorsed the two-state concept - a Palestinian state existing beside a Jewish state, "each recognizing the other as such, both democratic and respecting human rights, including minority rights." The fact that about three-fourths of each group supported that idea was reflective of other data but "not consistent with perceptions," said Lubetzky. "The silent majority is speaking out," he said. Among the other 24 percent were some adamantly opposed to any Palestinian political entity and others who advocated the abolition of Israel. Most questions dealt with familiar issues such as whether the 1967 borders of Israel should be restored, an end to Israeli occupation, political control of Jerusalem, access to holy sites and education. Results showed Palestinians "overwhelmingly" against Jewish settlements and Israelis opposed to refugees' right of return, but those questions were not specific enough for clear-cut findings, the group said. Lubetzky, an American Jew born in Mexico, and Darawshe, a Palestinian native of Nazareth, admitted to frustration over a lack of media attention to their project. "Good news doesn't sell," Lubetzky said. "We do not produce blood, therefore it is not so exciting." OneVoice, an initiative of New York-based PeaceWorks Foundation, aims to "empower Israelis and Palestinian on the ground to achieve a consensus on core issues that can form a roadmap for conflict resolution," according to its Web site. Polls can be skewed by how the questions are asked. There are college courses teaching how to get a specific predetermined percent when taking a poll by learning how to ask the questions. I'm sure the reason why the liberal press did not fall over each other to make this poll a front page story is because it was so openly skewed. I wonder how many of the 76% of Jews would have said yes to a terrorist State given to the Palestinians from where they would forever torture the Jews of Israel? I wonder how many of the Palestinians would have polled yes to forever submission to the Jewish State of Israel in exchange for a disarmed State of their own? I'm sure 76% of any polled group would say yes to "pie in the sky" questions that have nothing to do with reality. However, I know through the pressure of the gentile nations, and the secular Israeli politicians that a two State solution will be the only solution offered. There really is no choice. It really makes no difference what percentage are for or against. The secular men of this generation are adamant that they will defy the Biblical revelation of a coming Kingdom. I only wonder what the percents would be if men were asked to tolerate a puritanical King who would rule the world by His personal righteous standards, and would not allow any other religion but a perfect Biblical Judaism to be practiced? I only wonder what the percent would be if it were known this King would rule with a rod of iron forcing all men to accept His fundamental Biblical doctrine? No interpretations of the Bible would be allowed other then His fundamental, literal approach. I'm afraid the percents would be very low. All men would vote for war no more when the swords are turned into plowshares, and the lion and lamb lying together in perfect peace. It is only when the reality of perfect righteousness is added that the hardness of sinful hearts comes to the forefront. It is then that the truth of antichrist is manifested. Friend, there will never be peace without perfect righteousness! Are you submitted to the righteous Biblical Christ?